Location, location, location! 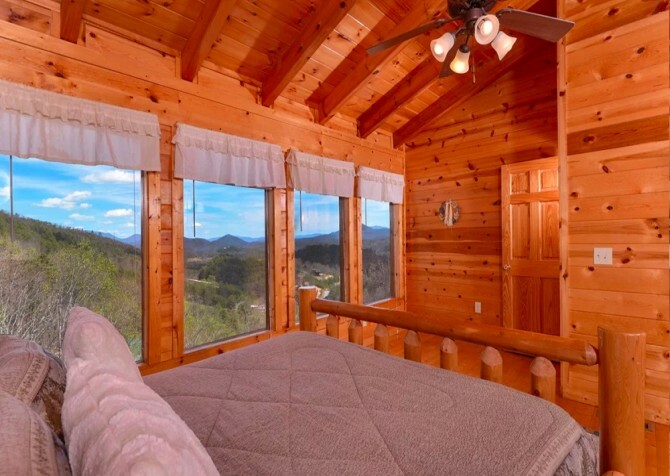 Our Pigeon Forge cabins are packed with awesome amenities and the conveniences of home, but your favorite aspect may be the options for where in Pigeon Forge you’ll stay. We have properties just minutes from downtown, along with cabins in beautiful Wears Valley, Walden’s Creek, Gist Creek, and Sevierville! 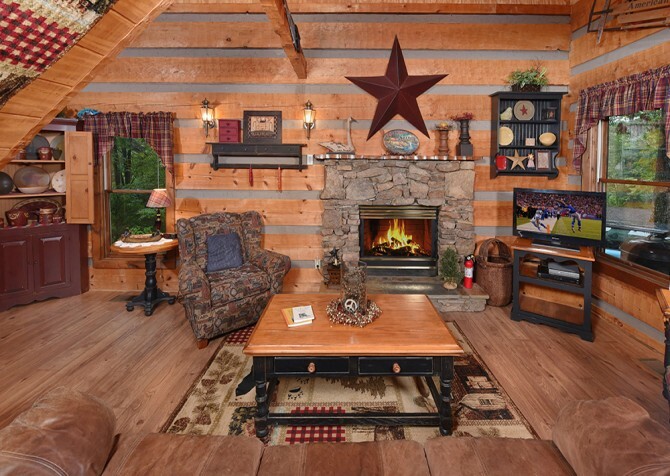 Call us at 1-800-684-7865 or browse our Pigeon Forge cabin rentals online. 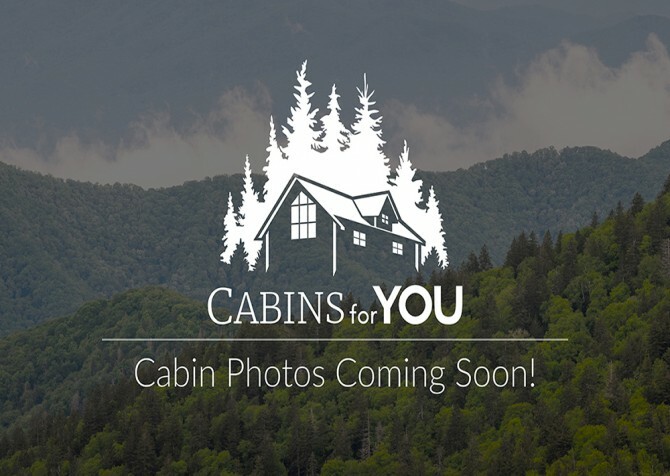 We can’t wait to find the right Pigeon Forge cabin for YOU! With its short drive to Pigeon Forge, Keaton’s Kottage makes it easy to enjoy group attractions along the Parkway. But even if you never leave your driveway, this cabin provides plenty of ways to relax and have fun. 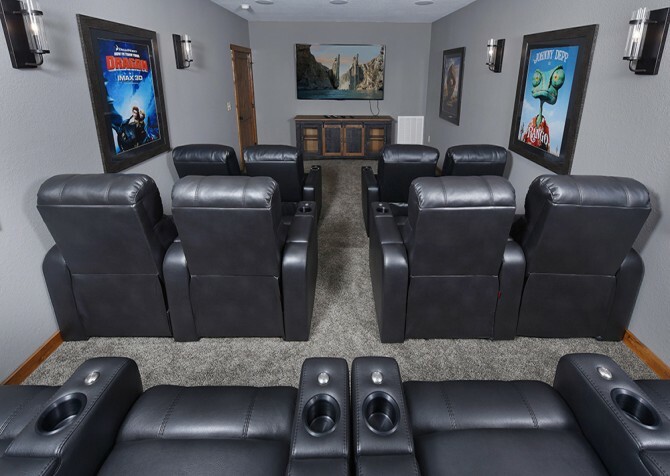 Enjoy a private home theater for movie nights, a private indoor pool for year-round swimming, a game-equipped loft, wooded views, and double hot tubs—not to mention access to a community outdoor pool! A convenient location less than 7 miles to downtown Pigeon Forge, a bubbly hot tub on the back deck with tranquil woodsy views, a charcoal grill for cabin cookouts, a pool table plus a Multicade unit for fun, comfy king-size beds, and room for 12 guests make Friendly Bear Lodge a top 4-bedroom pick for your next family vacay or getaway with friends. 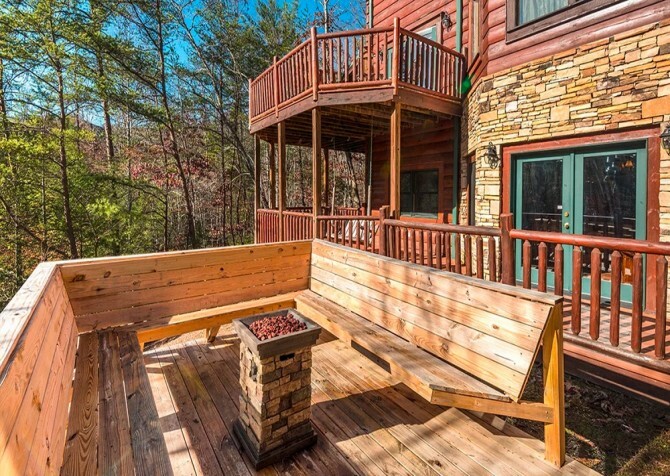 Amazing outdoor spaces impress at this 2-bedroom, 2 ½-bathroom cabin in downtown Pigeon Forge. Rock by the gas fireplace on the deck, soak in the covered hot tub, cook in the beautiful full kitchen, watch a game on the big screen TV, or play with the games in the rec room. Want more? The 2 master suites boast flatscreen TVs, king size beds, and double-sided gas fireplaces by the indoor jetted tubs. A premier location in the Sherwood Forest is not the only convenient feature Sherwood Sanctuary has to offer. 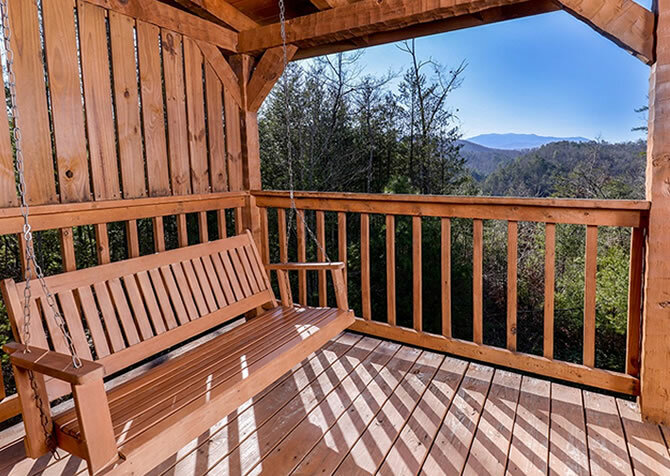 This 1-bedroom, 1-bath cabin also comes with mountain views from your rocking chair porch and a list of conveniences that will make you feel right at home. You can cook in your fully loaded kitchen, stay connected via the high speed Wi-Fi, and more! 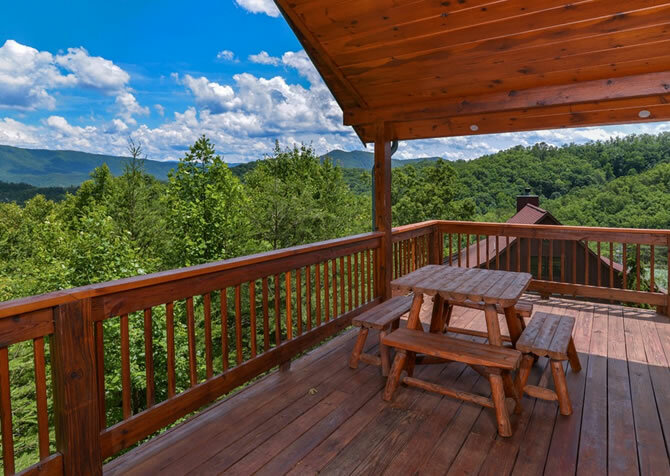 After mornings spent in Cades Cove and the Great Smoky Mountains National Park, return to the relaxation of your 12-bedroom cabin! Take a dip in the indoor pool, soak in one of two outdoor hot tubs, and play on the authentic arcade games in the game room. With so many amenities and space for 44 guests, everyone in the group will easily stay entertained! 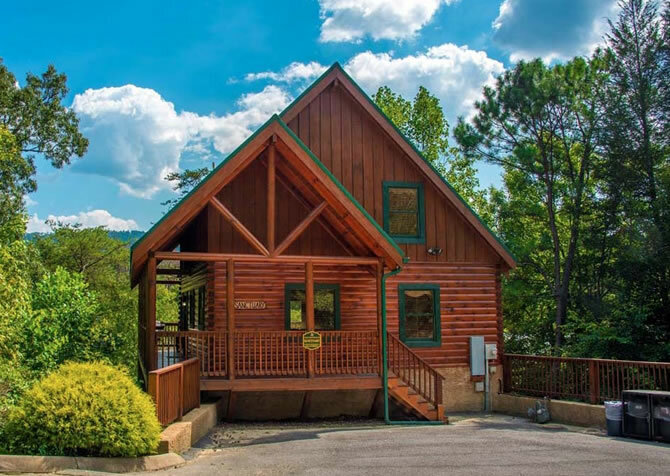 Find your happily Ever After less than 4 miles from downtown Pigeon Forge at this 1-bedroom, 1.5-bathroom cabin for 6 in Bear Creek Crossing Resort. 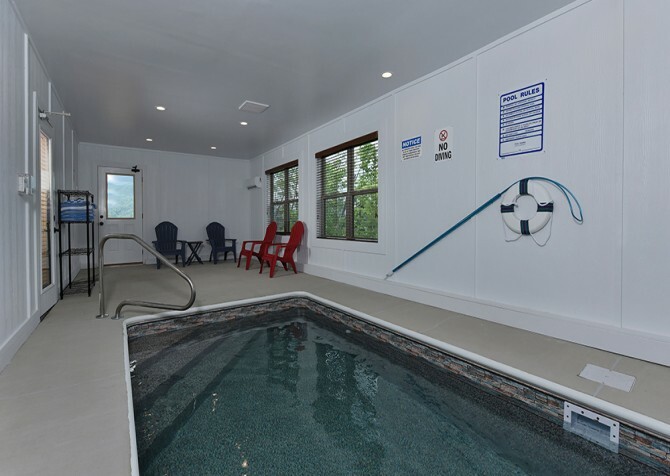 Splash at the community pools, host movie nights on the big screen TV, unwind in the bubbly hot tub, stream Netflix on the outdoor TV, play arcade games and pool in the rec room, and snuggle in the king-size bed. 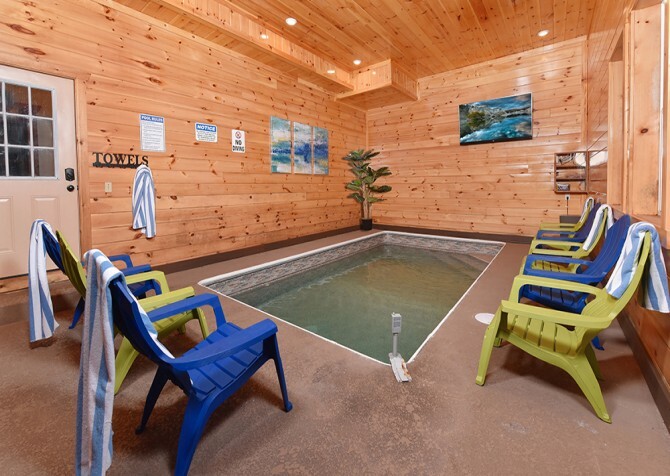 Not far from the fun of downtown Pigeon Forge, Splish Splash is an exciting, spacious, and comfortable mountain cabin. 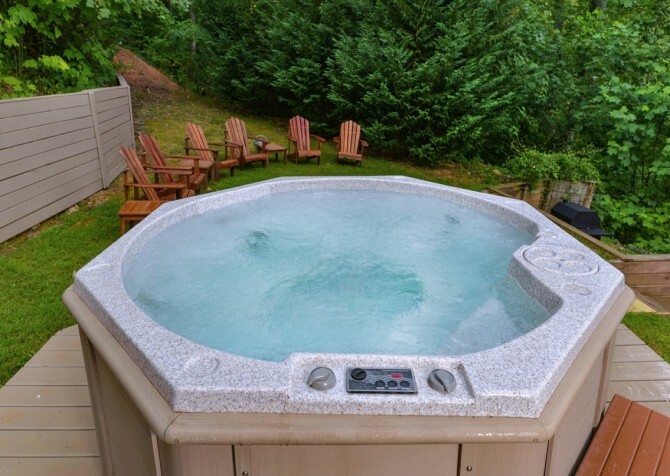 It features a washer and dryer, a relaxing outdoor hot tub, TVs in every bedroom, and high-speed wireless internet that will let you see what's happening during your stay. 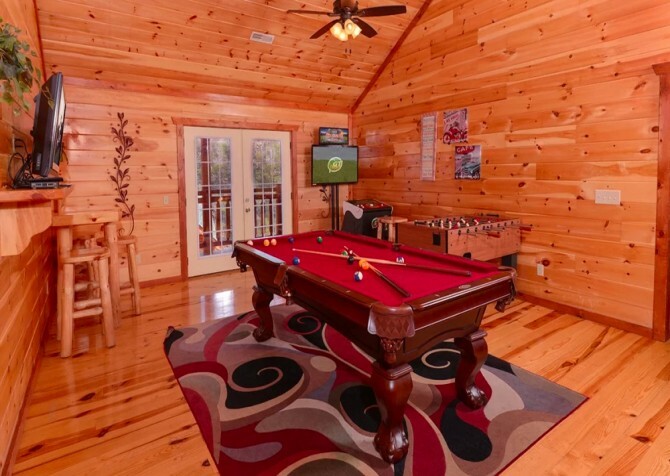 Entertainment comes in the form of an air hockey table, pool, and a big screen TV with Blu-ray player! 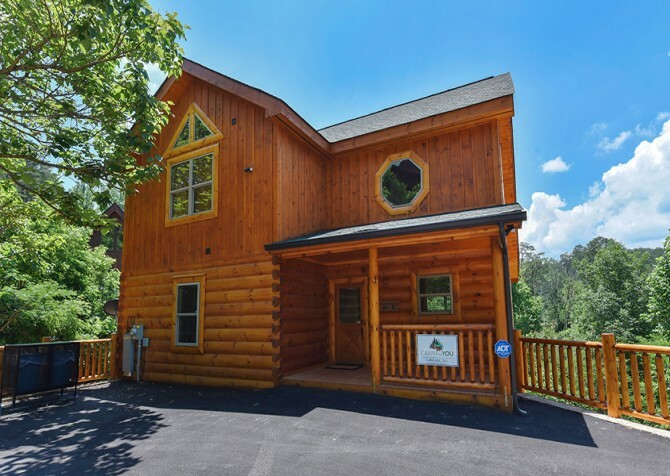 Nestled into the cabin community of Sherwood Forest, guests to this gorgeous 3-bedroom, 3-bathroom cabin with a private indoor pool and outdoor community pool access will have a convenient drive to hundreds of attractions in downtown Pigeon Forge, under 3 miles away. 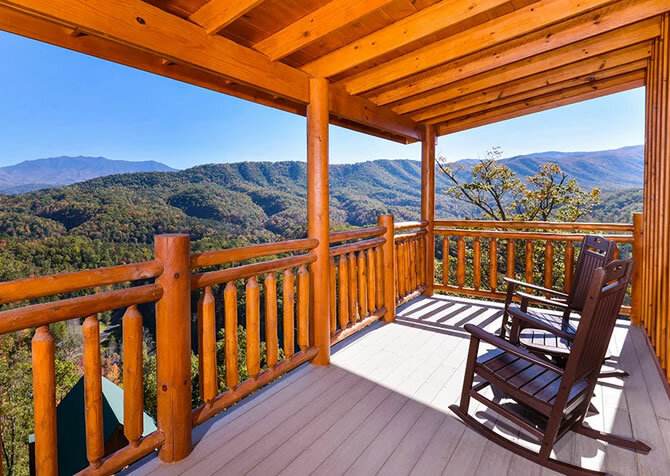 Stay close to all the action — attractions, restaurants, and more — when you stay at A Suite Escape, a Pigeon Forge cabin less than 2 miles from downtown. 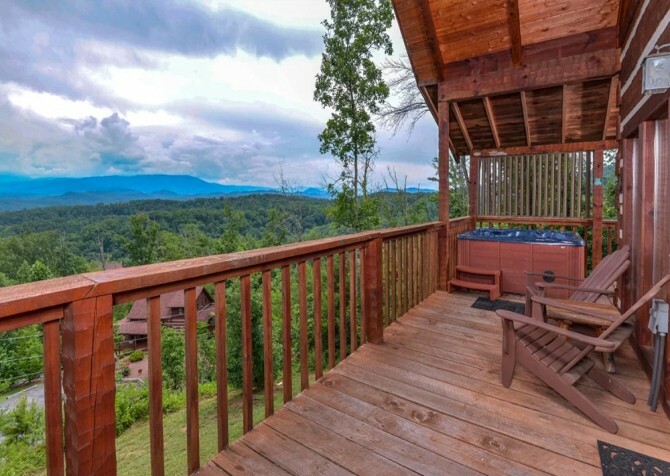 Featuring 2 master suites with private bathrooms, gas fireplaces, and jetted tubs, rec spaces with games and flatscreen TVs, and a covered back deck with a hot tub, you’ll appreciate returning to this Smoky Mountain home in the evenings. 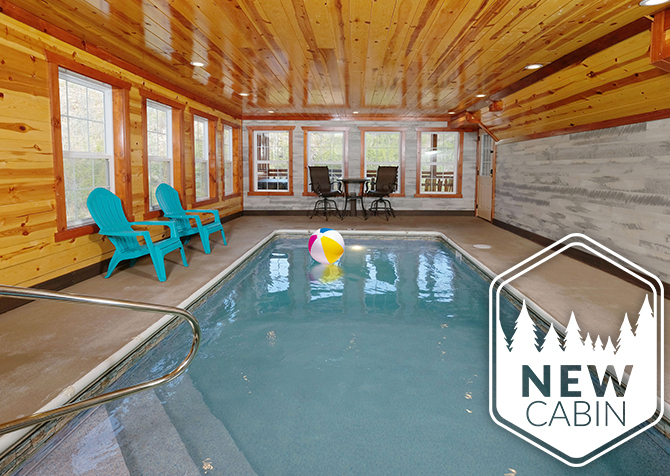 Located in Bear Creek Crossing, American Bear Cabin is a 2-bedroom cabin with access to indoor and outdoor community pools. Patriotic decor and comfortable interiors make it feel relaxing, fun, and homey, and the hot tub offers the ultimate in relaxation. 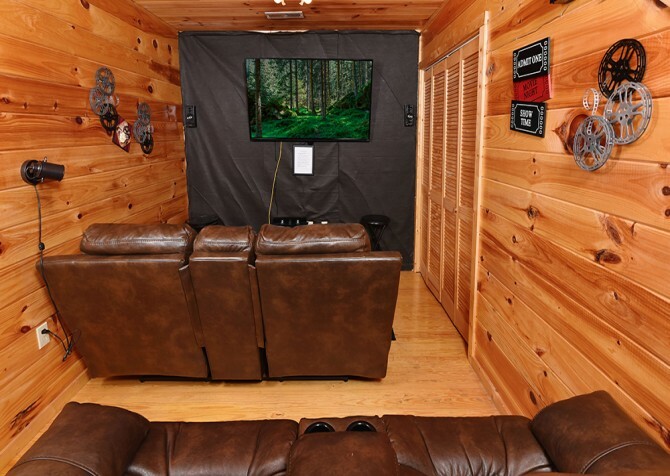 You can also watch TV on the big screen or pop in your favorite Blu-ray movies for a laid-back night in the cabin. Peacefully situated in the Beside the Still Waters community, In Green Pastures provides the serene retreat you're seeking. 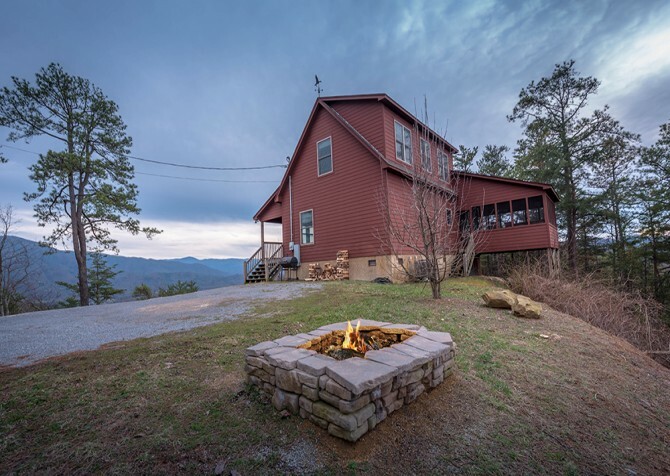 Slip away to this 1-bedroom cabin for 4 to hike nearby trails, sip coffee or soak in the hot tub on the wraparound porch, cozy up in front of the big screen TV and fireplace in the living room, or head to the community fire pit for s'mores and late-night chats. 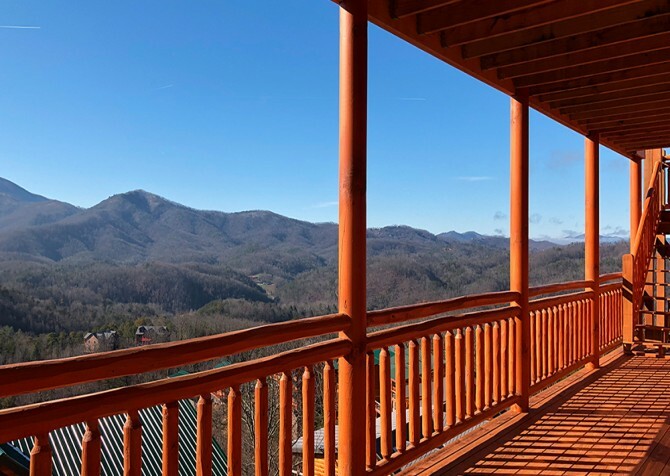 Stay in the perfect location right between Pigeon Forge and Gatlinburg at Magnolia Bearadise and enjoy double the fun at local attractions, shops, and eateries. 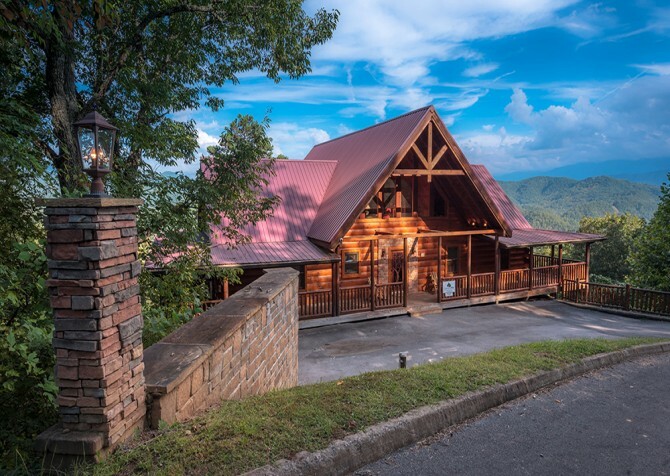 Plus, you’ll have a comfy place to call home while in the Smokies at this 3-bedroom, 2-bathroom cabin for 8 that features a big screen TV, an outdoor hot tub, king-size beds, and a twin bunk. 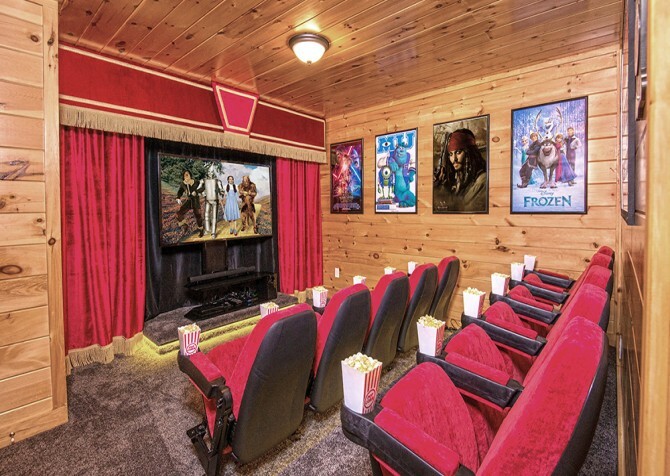 After exploring Pigeon Forge, head back to your secluded mountain home for movie nights on the big screen, arcade games and pool in the rec room, relaxing hot tub soaks outdoors, and sweet conversations on the porch swing under the stars at Wholly Smokies, a 2-bedroom, 3-bathroom, 1500-square-foot cabin for up to 6 guests. 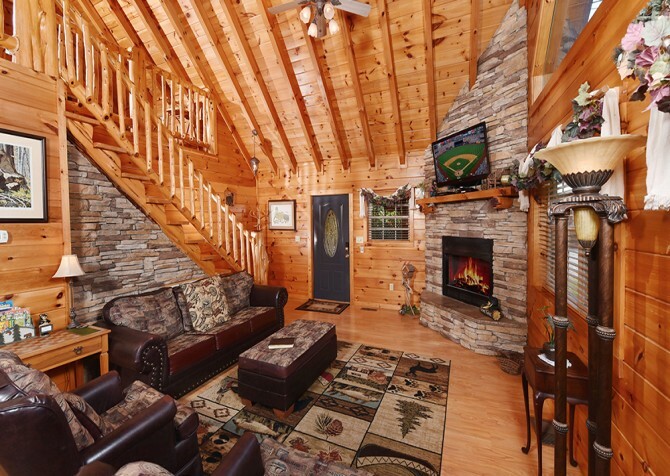 For a romantic cabin for 2 nestled in the Smoky Mountain woods, check out Angel’s Lair. 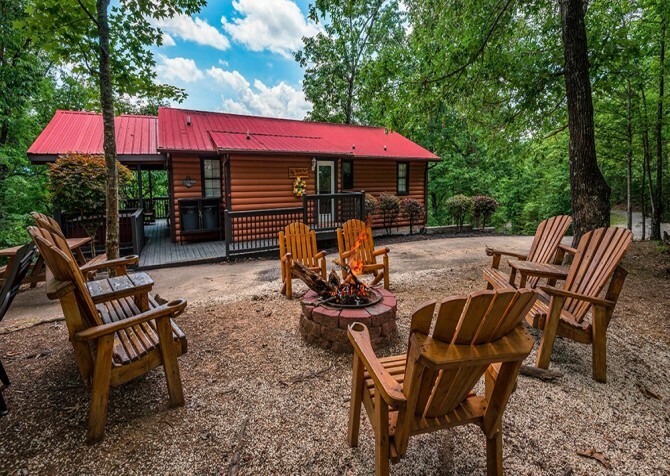 This 1-bedroom, studio-style cabin can also accommodate 2 other guests, if your Pigeon Forge adventure is a family affair. 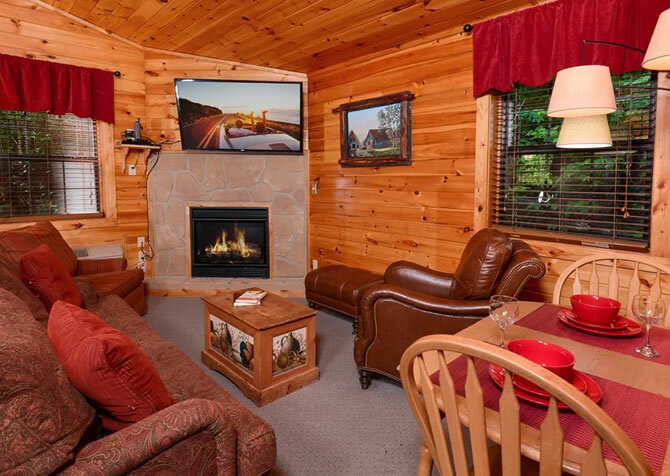 Enjoy an outdoor hot tub, gas fireplace, indoor jetted tub, and a giant flatscreen TV in this cozy cabin made for fun days and romantic nights. 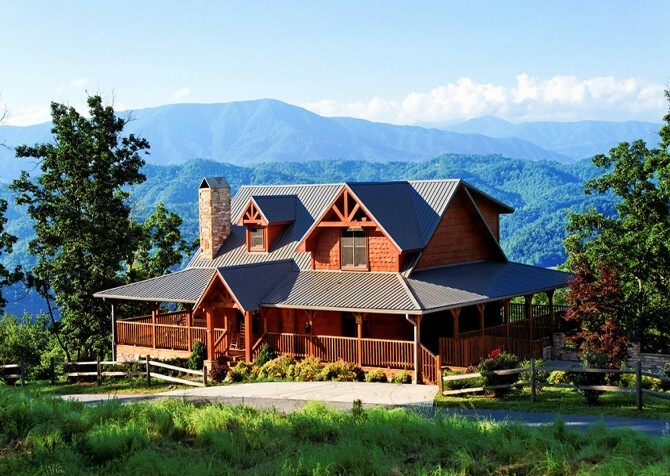 Sleeping up to 4 guests, A Mountain Hibernation is a 1-bedroom, 1-bathroom, studio-style cabin in Pigeon Forge, TN. Only 8 miles from the city center, this mountain home remains close to in-town attractions, restaurants, and shops. 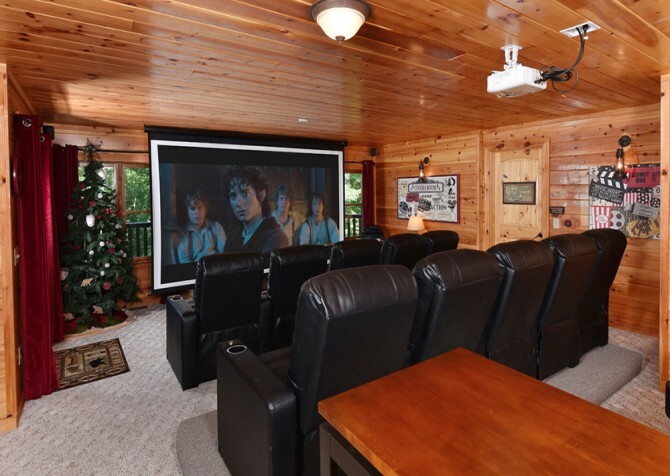 Plus, you’ll love viewing the mountains, reading by the stone fireplace, and watching films on the big screen TV at this Smoky Mountain home. 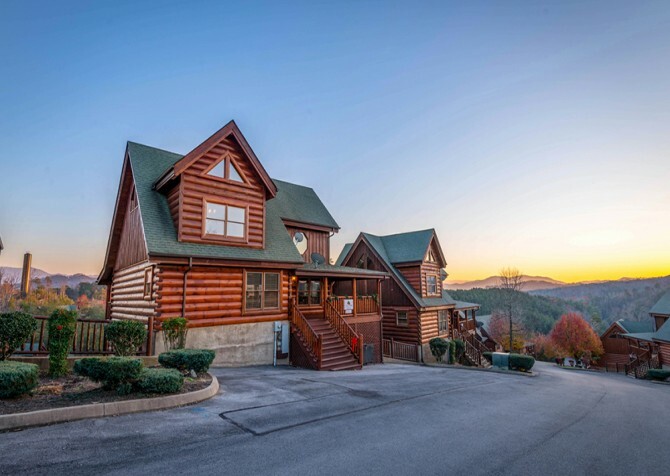 Close enough to Pigeon Forge for relaxing, convenient drives to hundreds of attractions, Almost Bearadise is also tucked away into the Smoky Mountain forestry. 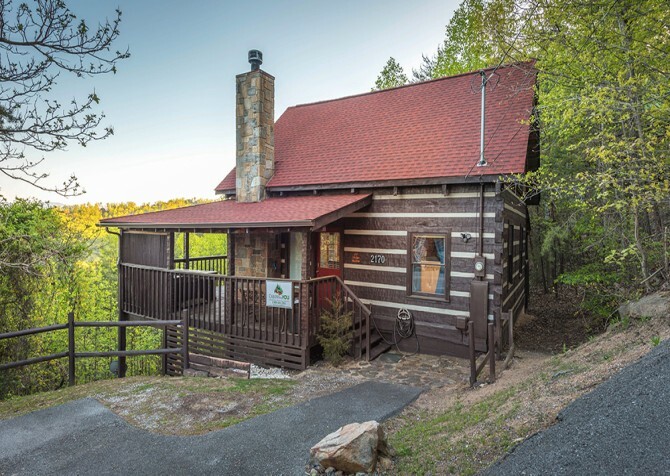 Enjoy soaking in the outdoor hot tub, sipping on hot cocoa while lounging in the rocking chairs, cooking together in the fully loaded kitchen, or cuddling by a warm fire in the stone fireplace of this charming 1-bedroom cabin. 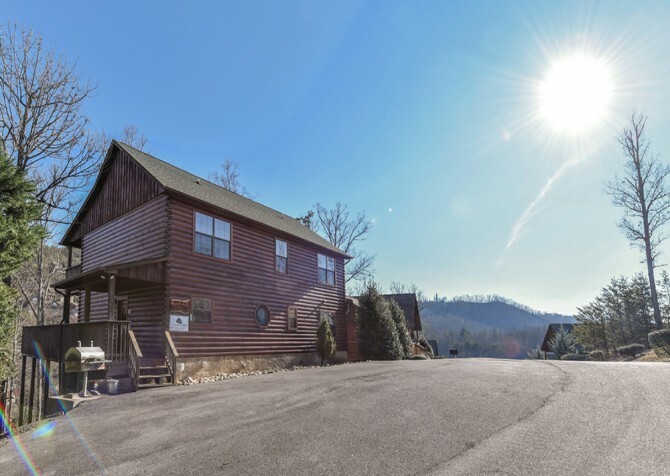 With sleeping space for up to 11 guests, host a multi-family Smoky Mountain getaway with convenient access to Pigeon Forge just a little over 1 mile from the downtown strip and hundreds of unique attractions! 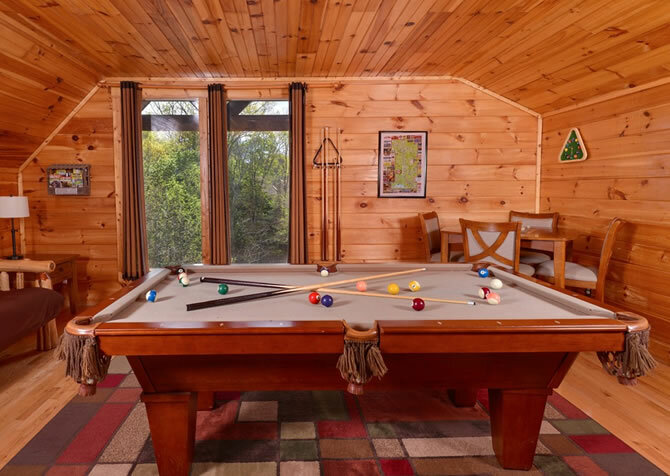 During down time, enjoy serene wooded views from the hot tub, playing pool in the game room, and reading a good book by the stone fireplace. 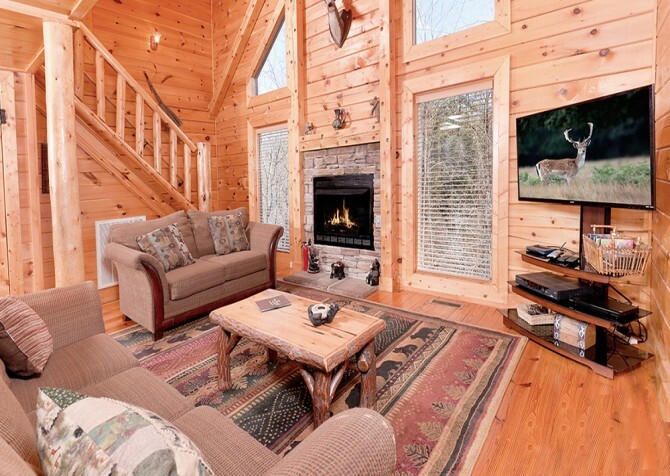 Spend enchanting evenings cuddling in front of the fireplace watching movies from the cabin’s DVD library on the 42” plasma TV. 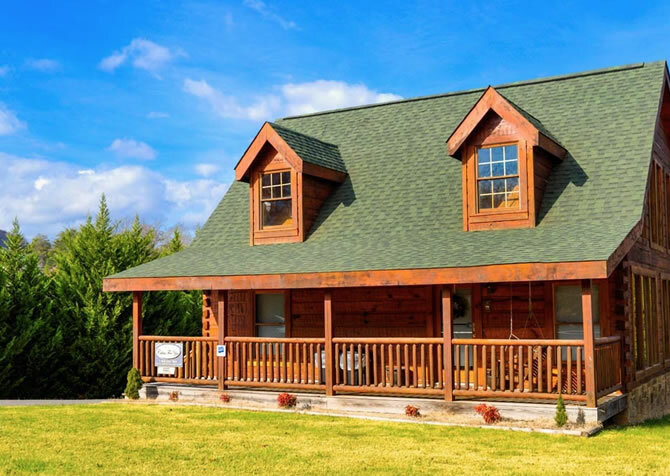 With room to sleep 4 guests, First Flight is great for a small family getaway or a romantic weekend in the woods – just a short drive from downtown Pigeon Forge! 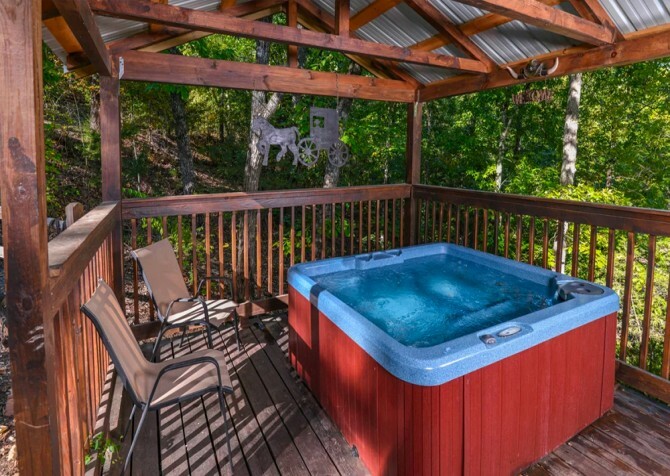 Located in Eagle Springs Resort, this 2-bedroom, 2-bathroom cabin offers community pool access! American Eagle is great for movie nights, with a DVD player and a big screen TV in front of a cozy wood-burning fireplace. 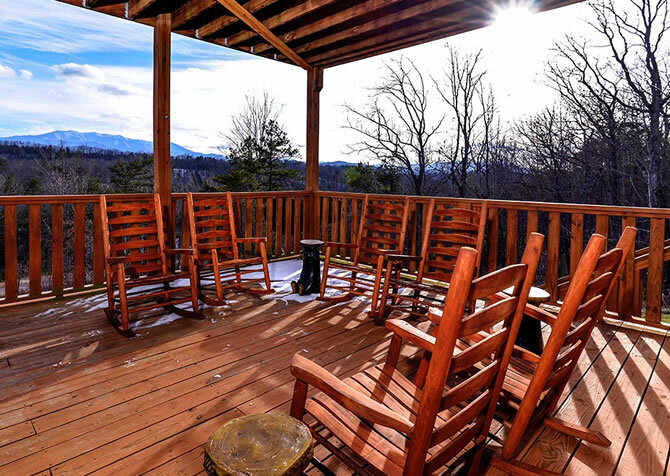 Outside, rocking chairs and a hot tub provide a lovely spot for taking in the beauty of the Smoky Mountains after spending the day playing in downtown. 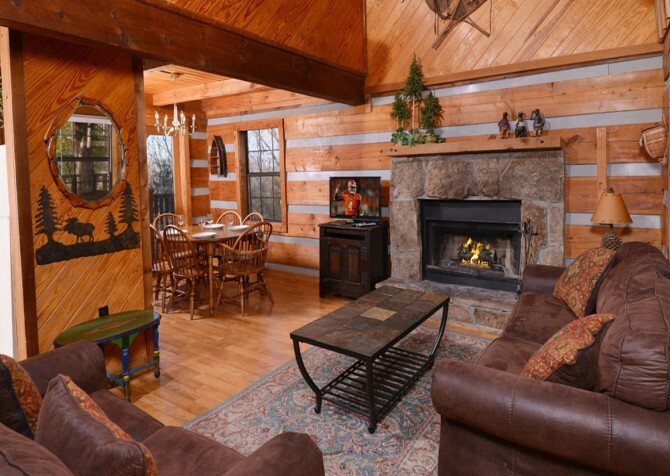 Enjoy luxury and comfort at Mountain Cascades Lodge, a 7-bedroom cabin in Pigeon Forge. With lots of amenities and room to sleep up to 25 guests, it's great for group getaways. Take in the views from your spacious decks or through the many windows in the living room before heading to the private indoor pool for some fun. 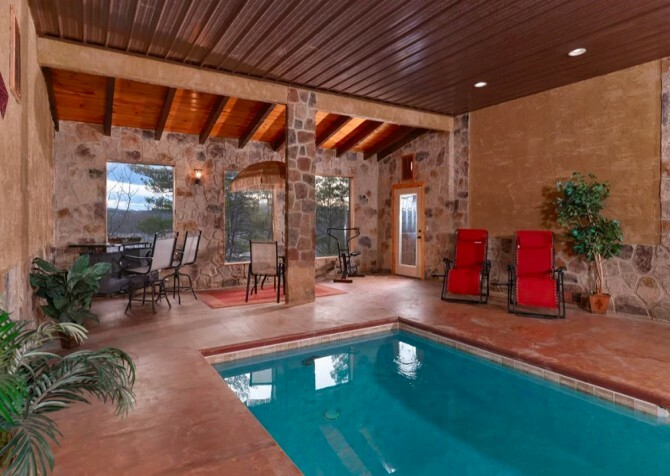 This beautiful room features a pool, stone details, small wading pool, and bridge! 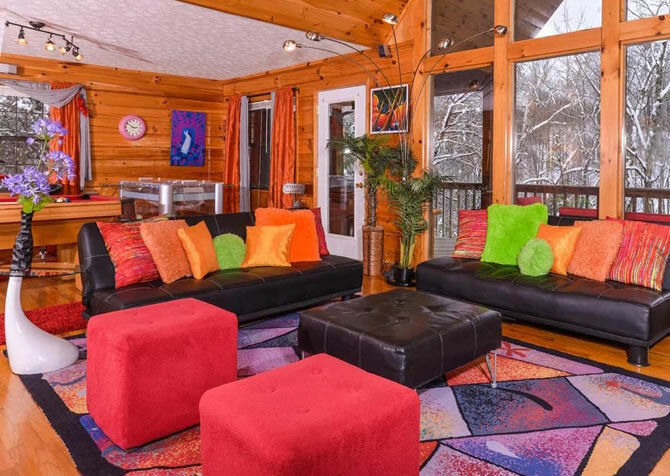 Spend days exploring downtown Pigeon Forge before heading back to play and relax at this pet-friendly cabin among the trees. 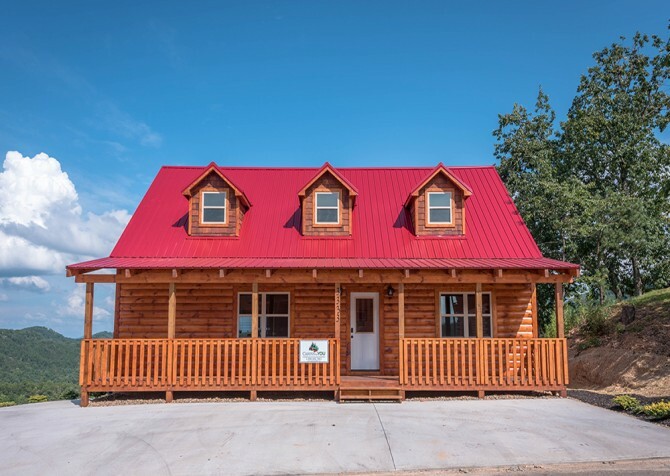 The cabin’s loaded with amenities, from a fully equipped kitchen and plenty of lounging space to game tables and king-size beds! Stream shows and movies with Netflix, pick up new release for the Blu-ray player, and end the night soaking in the jetted tubs! 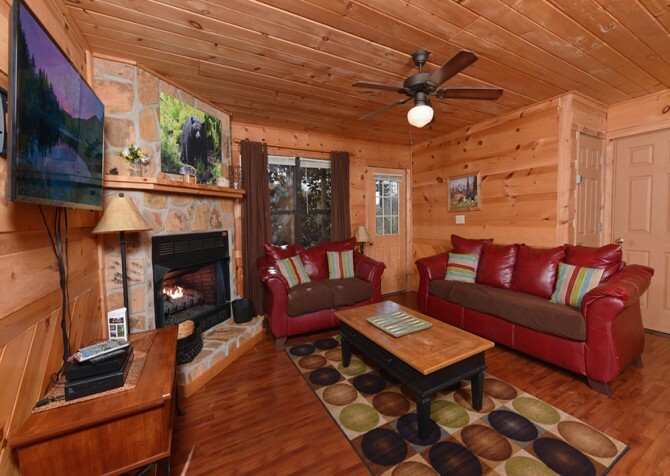 Be delighted from the moment you arrive at this picturesque 1-bedroom cabin rental. No steps into the cabin and a flat parking area, combined with a spacious layout and log interior, will make your vacation everything you had hoped for - easy, relaxing, and comfortable. Wake in the morning for a soak in the bedside indoor jetted tub located next to the king-size bed, shoot pool, or take a short drive to town for dining, shopping, and entertainment. 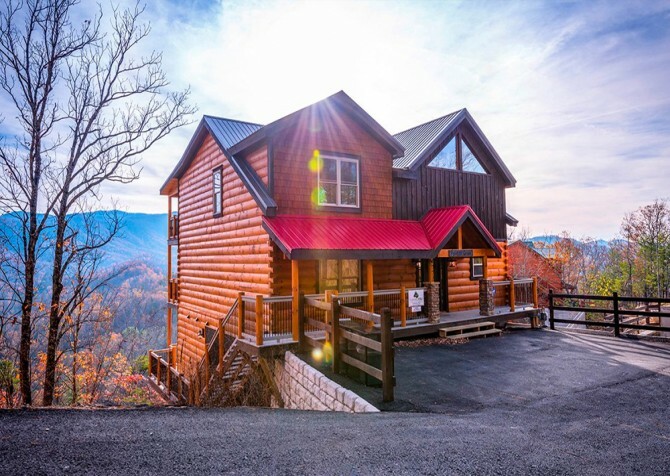 Convenient to the attractions of Pigeon Forge, Smoky Mountain Splash is a modern and luxurious cabin with plenty of space for a family or group of 10. Inside this cabin, enjoy an indoor jetted tub, a pool table, a fully equipped kitchen, a private indoor pool, and so much more. 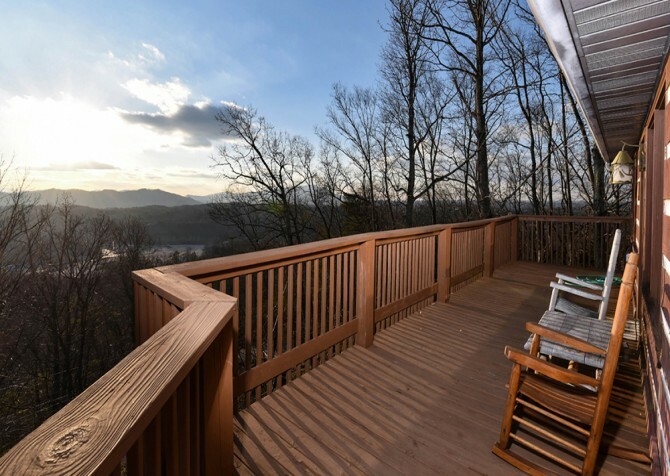 Outside, enjoy Smoky Mountain views and great spaces to enjoy a cup of coffee in the great outdoors. Modern meets the mountains in this lovely 1-bedroom cabin under 1 mile from historic downtown Sevierville, the original home to Dolly Parton, where guests can explore the quieter town of the Smokies before returning to swim in the indoor community pool, soak in the outdoor hot tub, and watch movies on the large flatscreen TV by a warm fire at night. 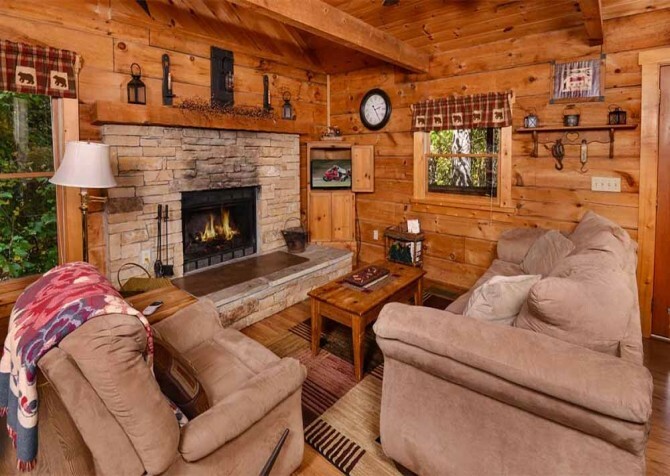 Rustic outside and elegant inside, this lovely 2-bedroom cabin with room for 8 is great for romantic getaways. 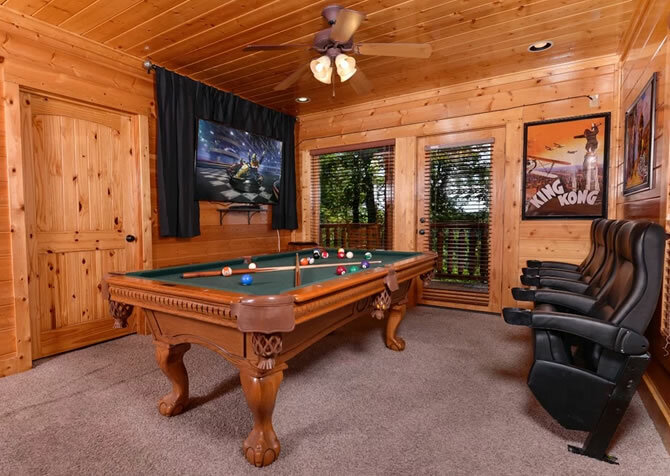 It features an awesome theater room, pool table in the rec room - and a multicade, Wi-Fi, a fully equipped kitchen, nice mountain views, and a location less than 10 miles from downtown Pigeon Forge. 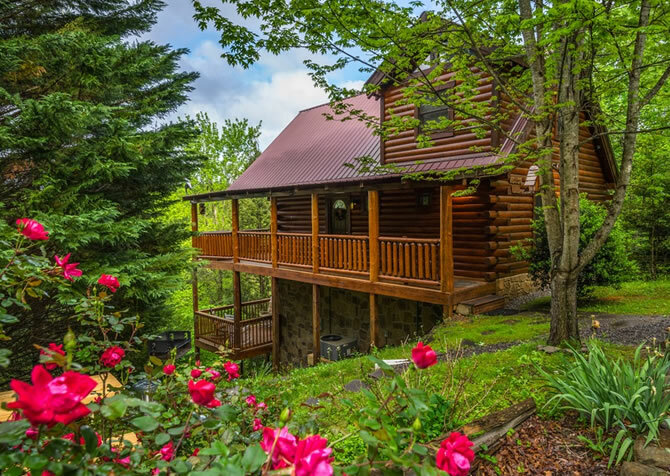 Only 6 miles from downtown Pigeon Forge, Patches Cabin features unforgettable mountain views thanks to its location in the Summit View Resort. 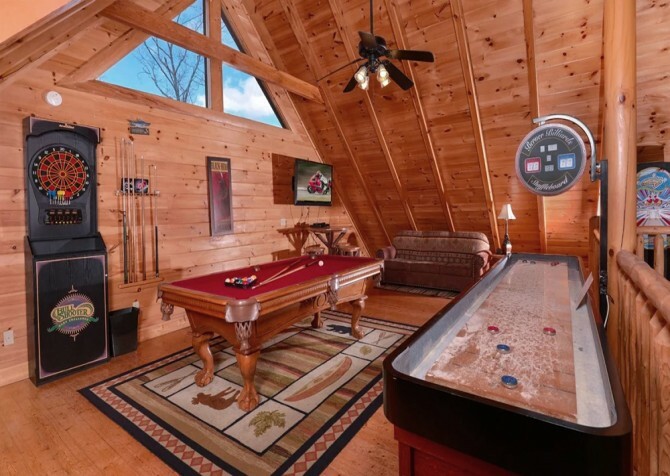 Enjoy entertaining amenities, including a game room and access to a catch-and-release pond, at this cabin for 10. 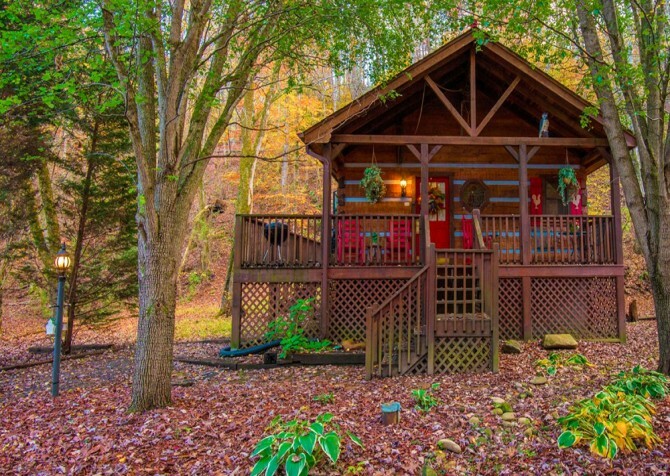 Experience true Tranquility at this 1-bedroom, 1.5-bathroom cabin for 4 in Pigeon Forge, less than 10 miles from downtown. 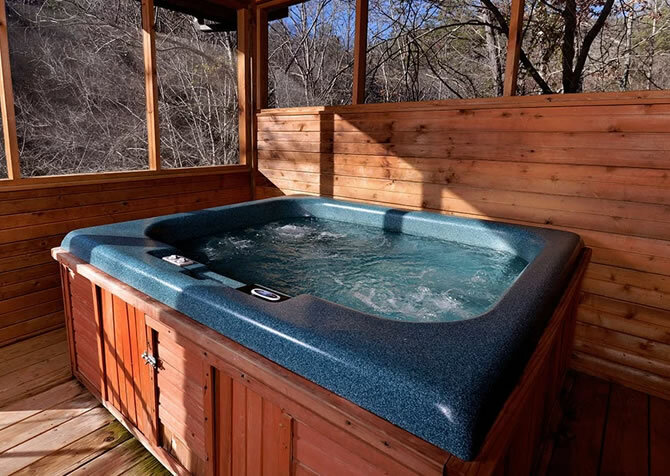 Calming woodsy views, a soothing outdoor hot tub, rocking chairs, a comfy king-size bed, and an indoor jetted tub await to provide the ultimate in comfort on your vacation. Other amenities include a gas fireplace, flatscreen TVs, and a foosball table! 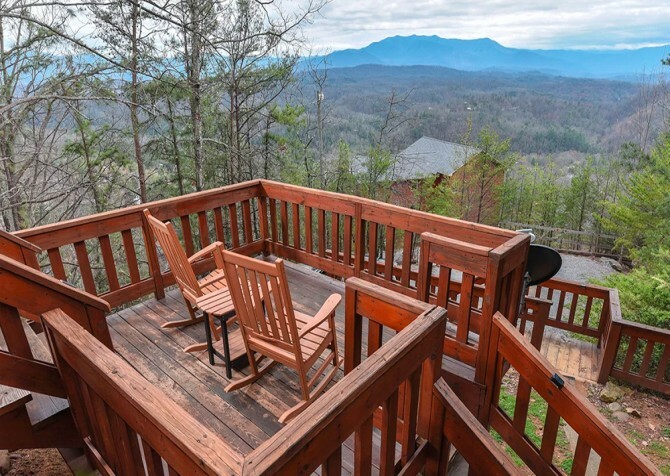 Looking to stick close to town but still want a mountain view? Splash n More is the perfect place for YOU! 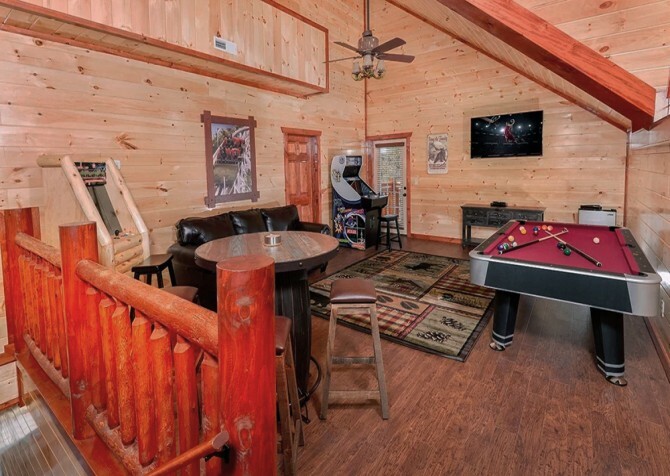 Featuring a private indoor pool, an outdoor hot tub, a big screen TV, king-size beds, and a fully loaded rec room, this 3-bedroom, 3-bathroom cabin for 12 in Pigeon Forge is sure to please — with community amenities through Bear Creek Crossing Resort no less! 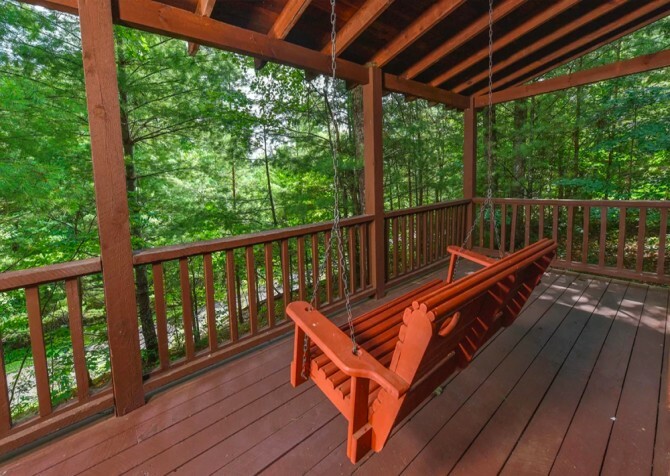 Peacefully situated among the trees, A Morning Song boasts wooded views, nearby walking trails, a PlayStation 2, Blu-ray and DVD players for movie night, board games and books, and a movie library. Plus, enjoy conveniences like a washer/dryer and full kitchen! 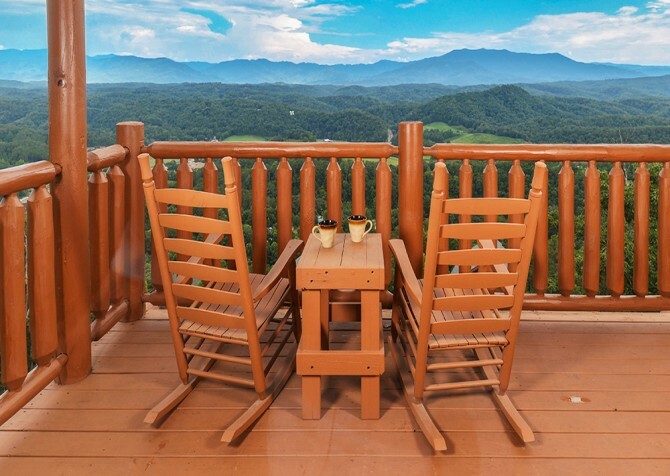 As you sip coffee on the deck, breathe in the fresh mountain air and enjoy the lush surroundings of the Smokies. 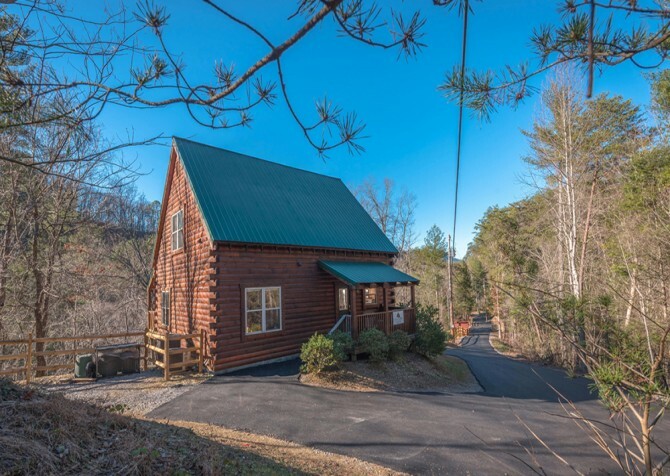 Ideal for a 2-person getaway or family trip of 4, Shades of the Past is a 1-bedroom, 1-bathroom cabin less than 4 miles from downtown Pigeon Forge fun. Easily shop, eat, and explore the area before heading back to unwind. 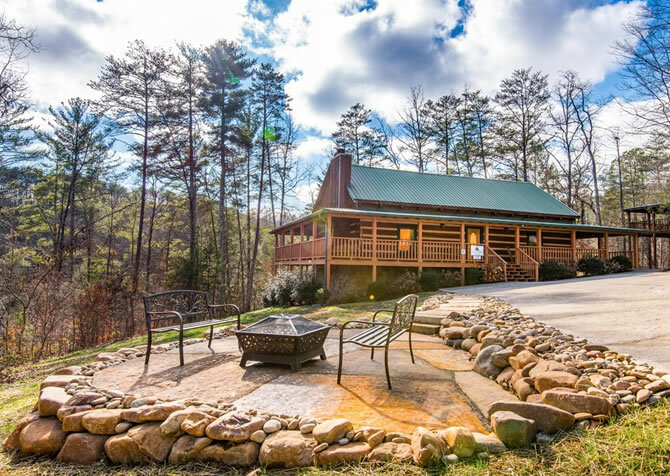 Enjoy valley views, a screened-in outdoor hot tub, an indoor jetted tub, comfortable living spaces, and more at this cabin! 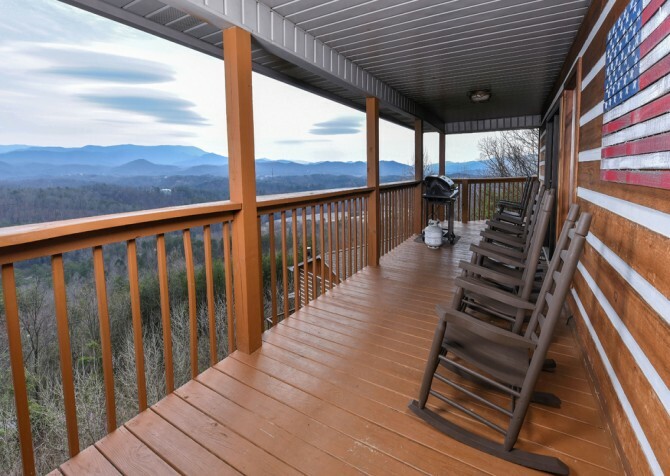 Enjoy a lovely mountain view when you vacation to this 2-bedroom Pigeon Forge cabin rental that's great for a fun family vacation or a laid-back weekend with friends. 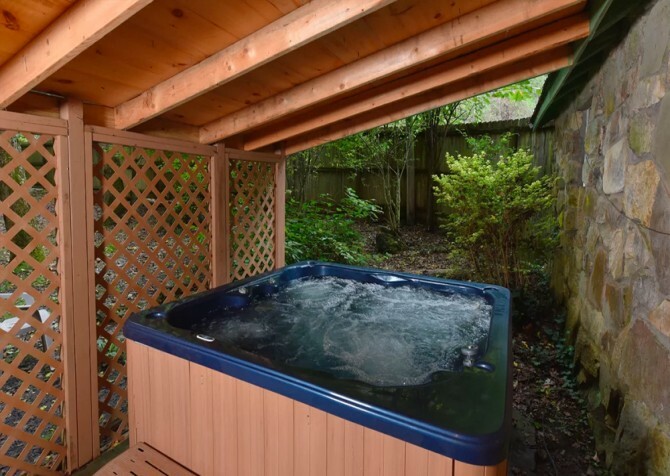 Soak in the large hot tub or sip a cup of coffee on the outdoor furniture in the mornings. A 6-foot scrapbooking table and satellite add extra touches while the pool table - for hours of fun - overlooks your charming view. 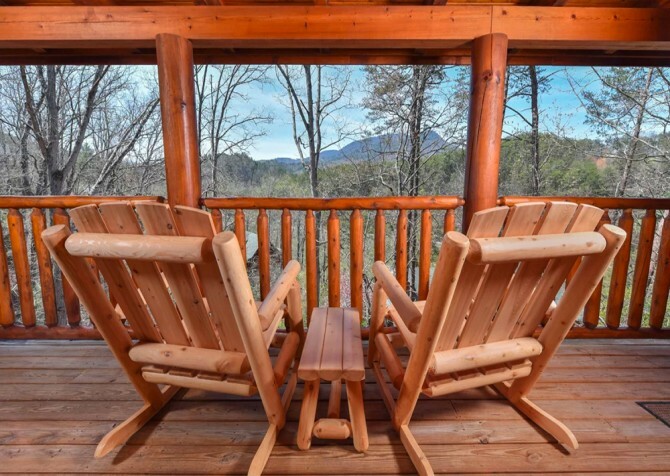 Soak in incredible views from the rocking chairs on the back deck, from the Legacy Mountain Resort community pool, or while relaxing by a fire in the living room in this gorgeous 2-bedroom, pet-friendly cabin for up to 8 guests. 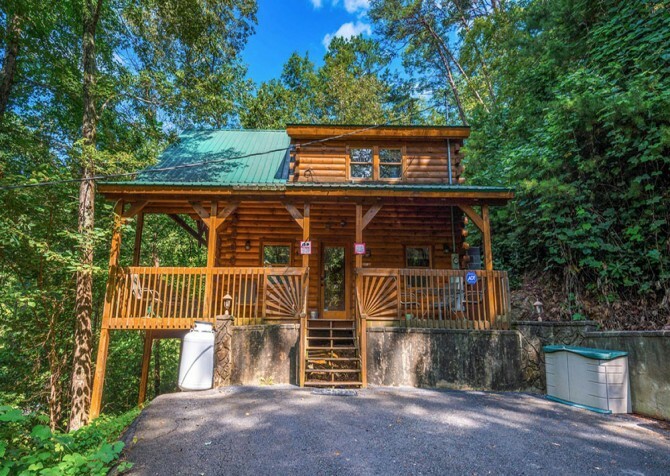 Located in the heart of Pigeon Forge, Smoky View on the Rocks will keep you close to local attractions, making this 2-bedroom, 2-bathroom cabin a steal! Head downtown, only minutes away, for an exciting day at Dollywood or the Island or both! And come back to the cabin for a comedy classic on the big screen TV, a well-deserved soak in the hot tub, or a relaxing round of pool. Surprise your favorite person with a special getaway to this 1-bedroom cabin fit for 2 with all the makings for romantic evenings. 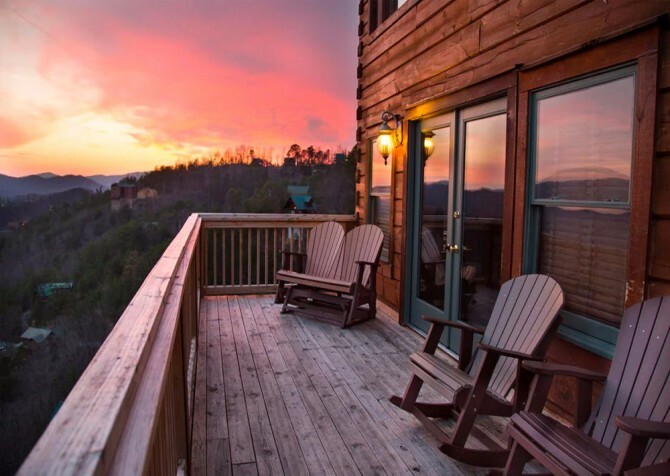 Sit down for romantic candlelit dinners for 2, climb into the heart-shaped jetted tub for a quiet night in, or take the short 2-mile drive to downtown Pigeon Forge for shopping, eating, and exploring the many attractions and events! 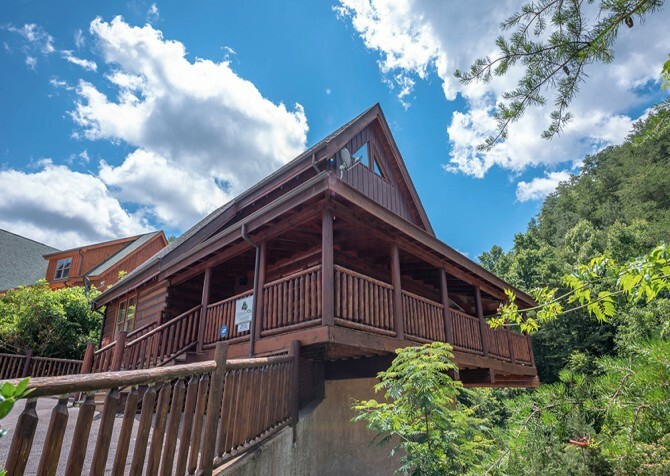 With a convenient location only 7 miles to downtown Pigeon Forge, Up the Creek is a great 3-bedroom option for those wishing to experience the serenity of the Smokies without sacrificing distance to exciting attractions. After playing in town, listen to the river rush past on the decks, watch movies on the big screen TV, and soak in the soothing hot tub. 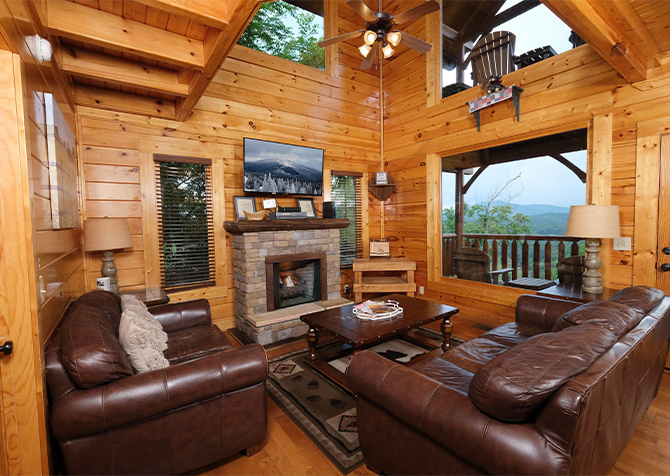 Get away for romance and relaxation in this 1-bedroom + loft, 1-bathroom cabin in Pigeon Forge. 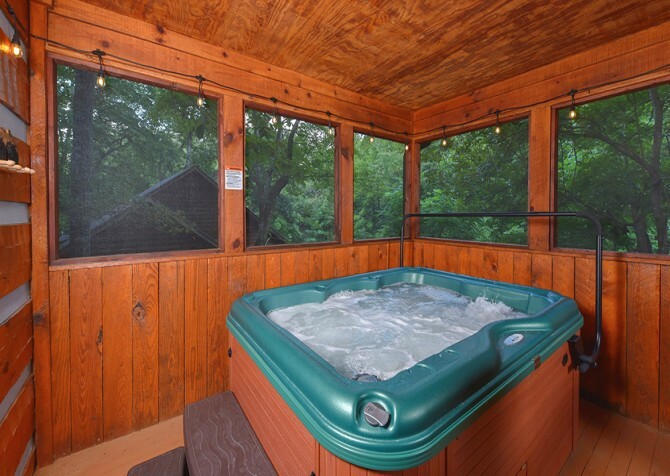 Unwind in the hot tub or on the porch swing, soak in the indoor jetted tub, or play pool or board games. Enjoy the conveniences of a washer/dryer, full kitchen, charcoal grill, telephone, and TV in the bedroom. On cold nights, don't forget to stay cozy by the wood-burning fireplace in the living room. 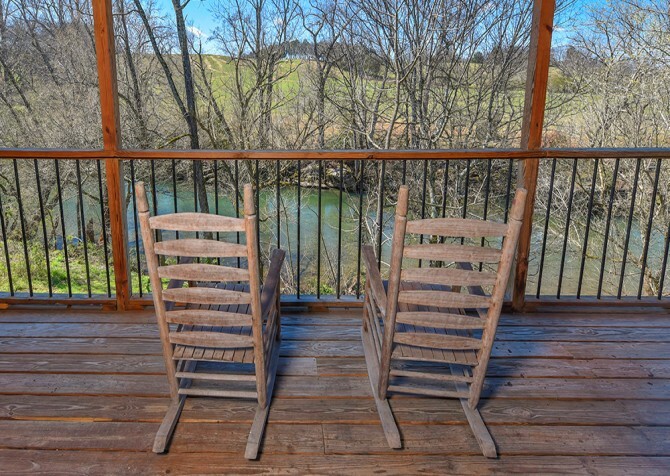 Located 3 miles from Parkway attractions, restaurants, and shops in Pigeon Forge, Around the Bend is a great option for families and friends planning to enjoy downtown and return to a cozy cabin in the woods. 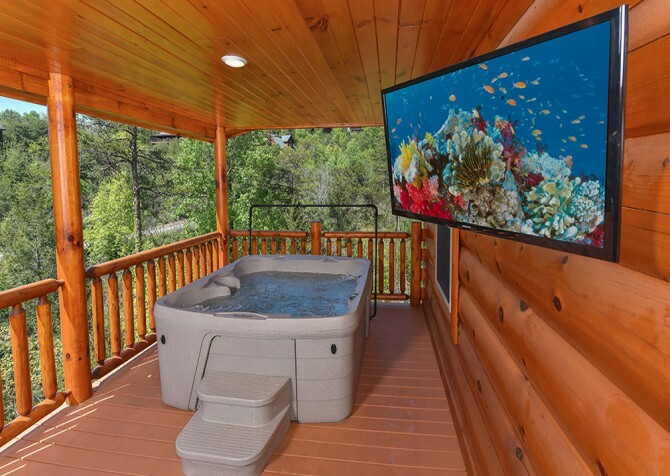 This 3-bedroom, 2-bathroom cabin for 10 boasts wall-mounted smart TVs, air hockey and table tennis, and a bubbly hot tub outdoors. 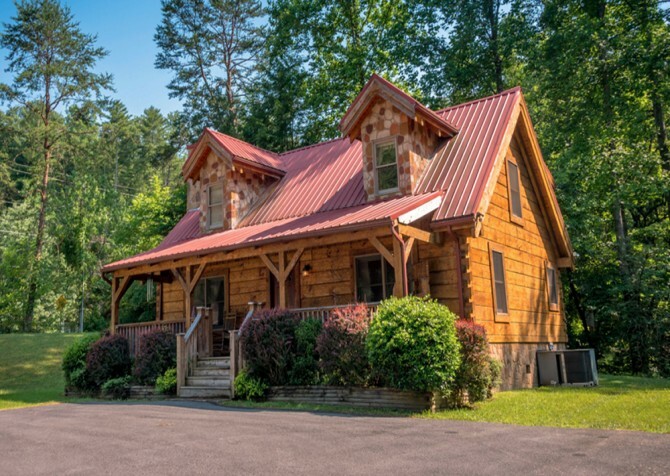 A beautiful, rustic cottage with a creek and a semi-private location, Stone Creek Cottage is perfect for a honeymoon, romantic weekend, or a small family vacation. 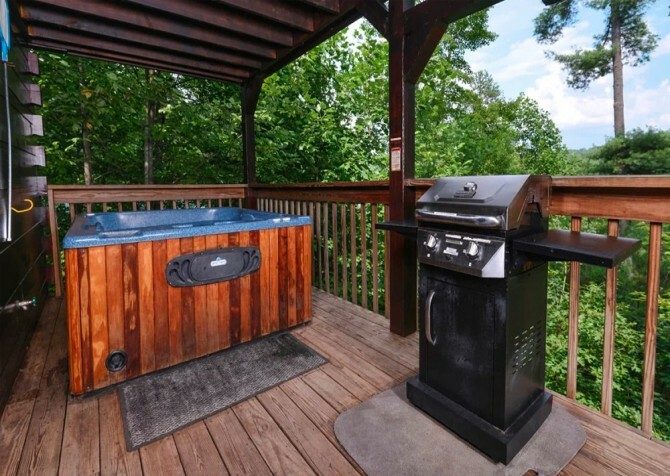 It offers the conveniences of home, including full kitchen, and grill, along with the amenities of a vacation rental – hot tub, indoor jetted tub, TVs in the bedrooms, games, and more! And it's all near downtown! Nestled in a cove off Flat Creek, Lakeside Mountain Memories brings you close to nature with a private floating dock on Douglas Lake. 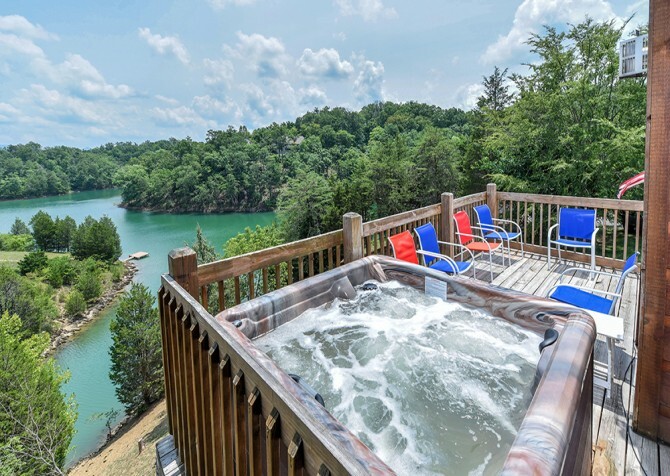 Spend all day under the sun and in the water, head downtown to attend Pigeon Forge events in the evening, and return to your cabin home for soaks in the hot tub, baths in the jetted tub, water views, and movie night on the big screen TV. 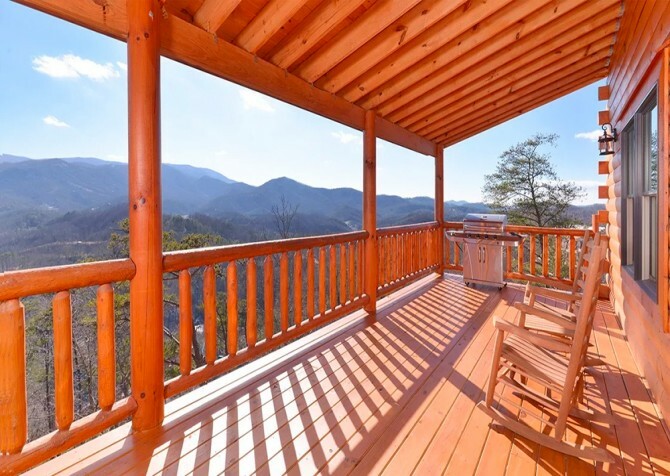 Boasting an Eagle View of the Smokies, this newly refurbished Pigeon Forge cabin boasts a screened-in porch with a hot tub and rocking chairs, 4K 65-inch ultra HDTVs, 3 king-size beds, a pool table and arcade unit in the rec room, complimentary Wi-Fi, a fully equipped kitchen, and more! Go on an adventure in town and let the good times continue at the cabin. 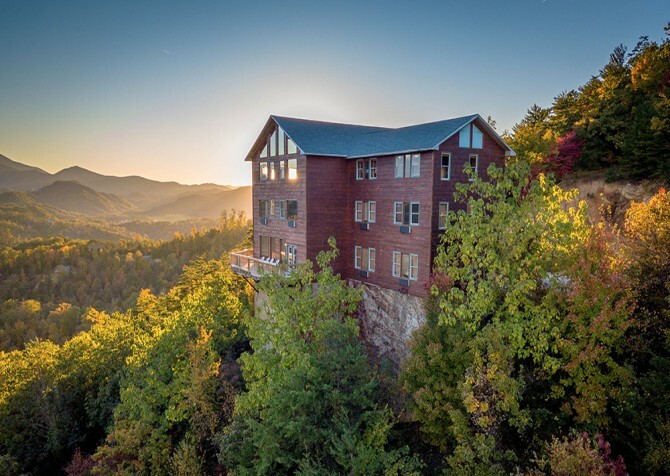 Offering modern conveniences and comfortable spaces, Simply Amazing is a great Smoky Mountain escape. 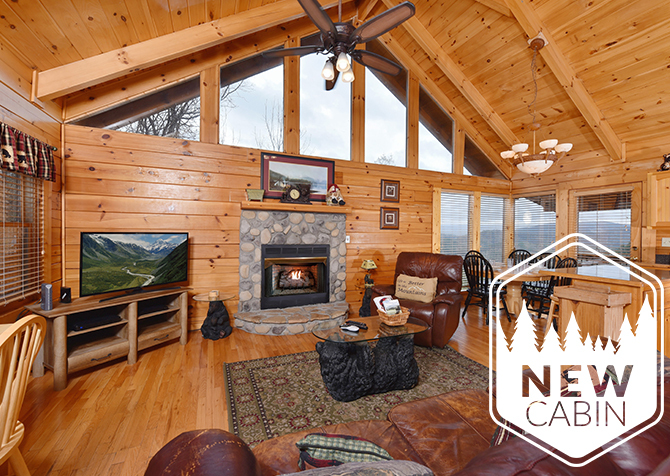 Get away for fun and relaxation to this 2-bedroom cabin with room for 8 guests. 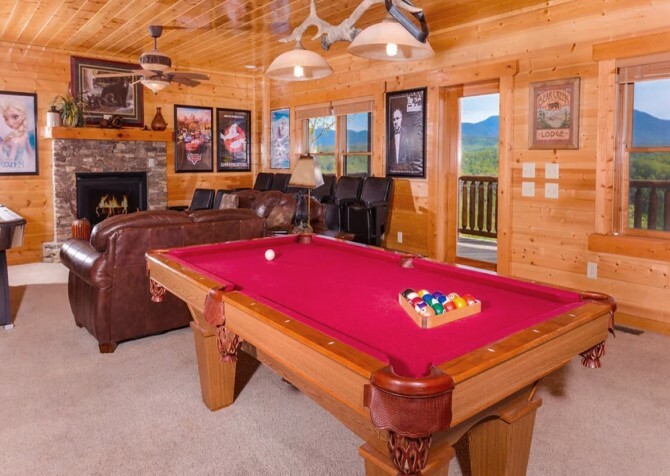 Boasting an air hockey table, pool table, big screen TV, mountain views, outdoor hot tub, stacked-stone fireplace, pool access, and dart board, it's great for families and friends looking to enjoy the best of a Smoky Mountain cabin! Only minutes from popular attractions like the Titanic Museum Attraction. Dollywood, The Island, and WonderWorks, Cuddle Bear provides a convenient location and a tranquil location among the trees of the Great Smoky Mountains. 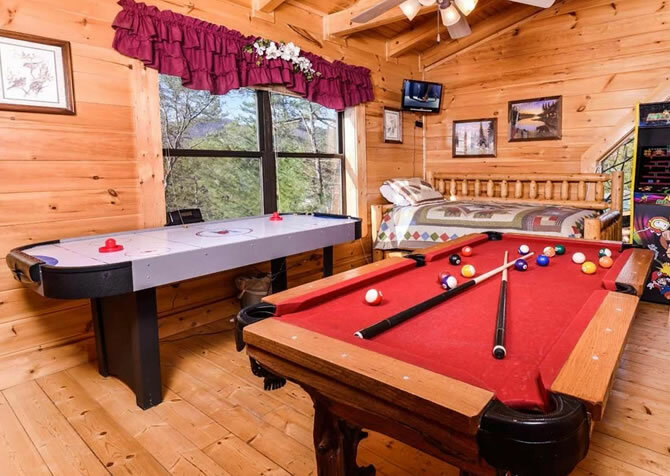 Enjoy an outdoor hot tub inside a screened-in porch, a master bedroom with its own jetted tub, and a multigame arcade inside this 1-bedroom cabin for 4. 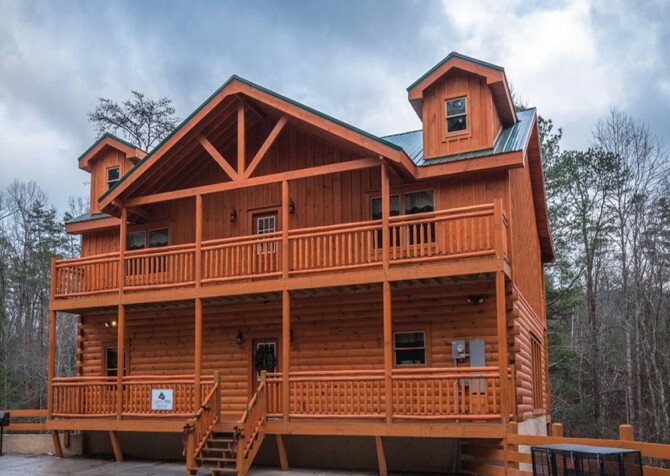 Just under 6 miles to the excitement of downtown Pigeon Forge, Wild Bear Lodge offers space for 28, with 8 bedrooms, 6.5 bathrooms, a large kitchen, plus 2 rec spaces with game tables. Soak tired muscles in the hot tub, sip wine by the fireplaces, splash at the community indoor pool, and sway on the porch swings with tranquil tree-studded views. Big Chill offers luxury, comfort, and relaxation. With room to sleep up to 6 guests, this 1-bedroom +loft cabin will entertain friends, families, and kids. Guests can gather on the stylish sofas in the living room to watch TV on the big screen, prepare meals in the full kitchen, or relax in the outdoor hot tub. 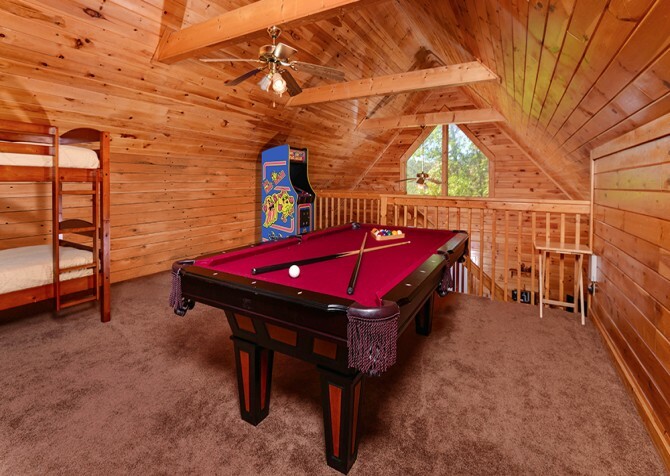 Kids will especially love the bunk beds and pool table in the loft! 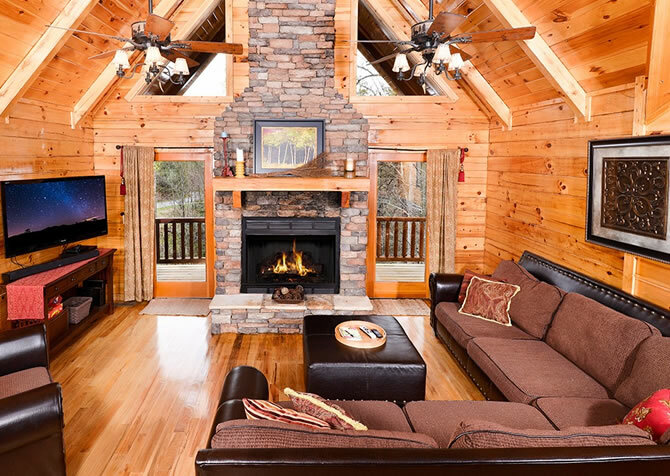 Great for a family or small group of friends, Traveler's Rest is a unique cabin in Pigeon Forge with awesome amenities, including a wood-burning fireplace, a fully equipped kitchen, multiple levels of decks, and a spacious rec room. 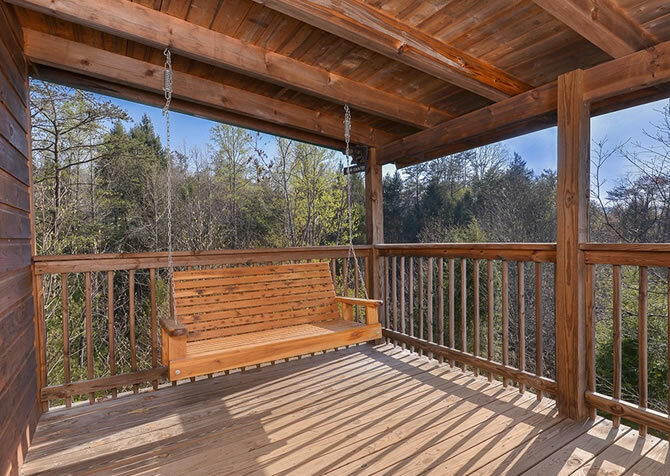 Chill on one of the 2 porch swings, enjoy a night soak in the outdoor hot tub, play a friendly game of pool, and watch your favorite TV show in bed. 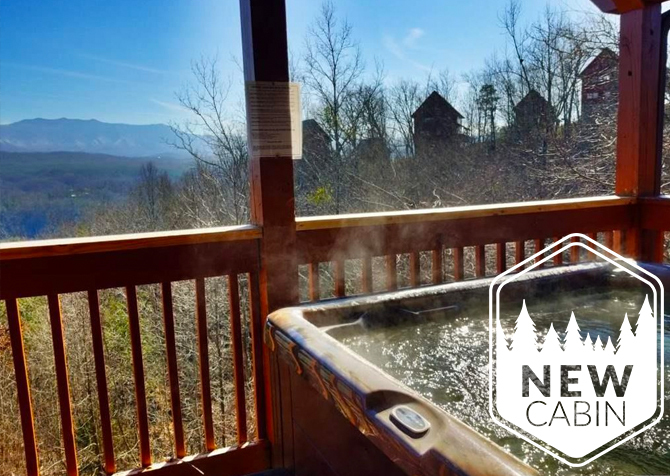 Enjoy the outdoor hot tub, gas fireplace, charcoal grill, indoor jetted tubs, and more at Bear Crossing, a secluded Smoky Mountain cabin in Pigeon Forge. After a fun night in the rec room, wake up to coffee on the porch swing and head to the city for a day of adventure downtown. Shop until you drop, dine with friends, ride mountain coasters, and take loads of group pics! 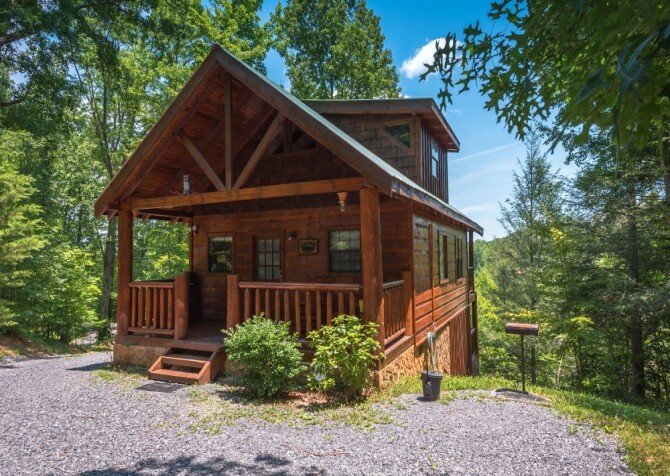 A charming cabin, this 2-bedroom, 2-bathroom rental can accommodate two couples, a group of friends, or a small family. It boasts a 42-inch flatscreen TV, an outdoor hot tub, an indoor jetted tub, DVD and CD players, a pool table, and a private screened-in porch. 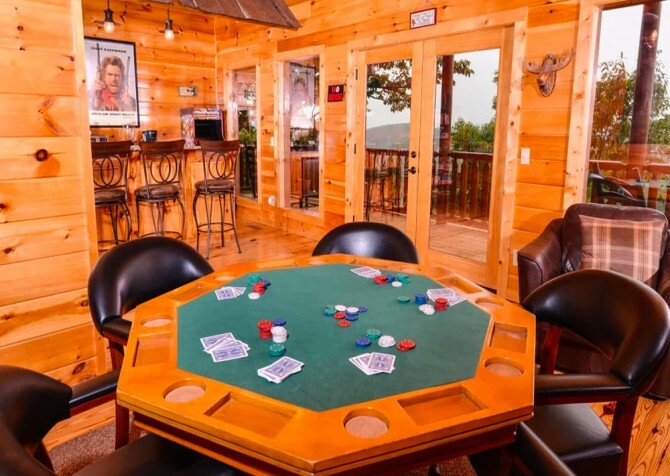 Guests can relax and play in the cabin or drive just 5.3 miles to the attractions and restaurants in downtown Pigeon Forge. 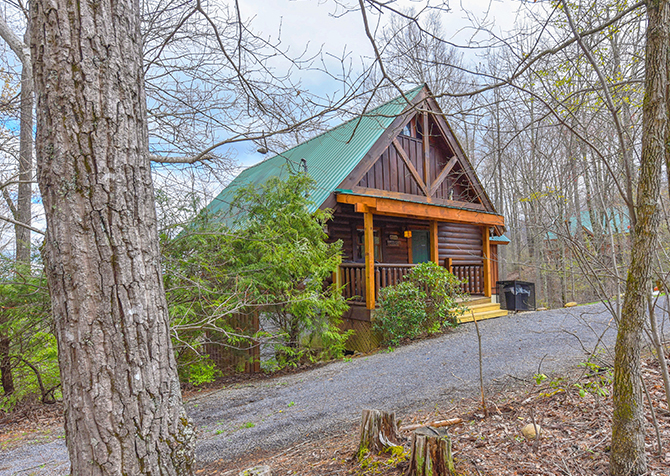 This modern cabin near downtown Pigeon Forge offers easy access to area attractions and peaceful wooded surroundings. Spend quiet mornings sipping coffee on the screened-in deck, laid-back days playing pool or swimming at the community pool, and nights relaxing in the hot tub or watching shows on the big screen TV. Each space is made for fun, relaxation, and comfort when you're away from home. 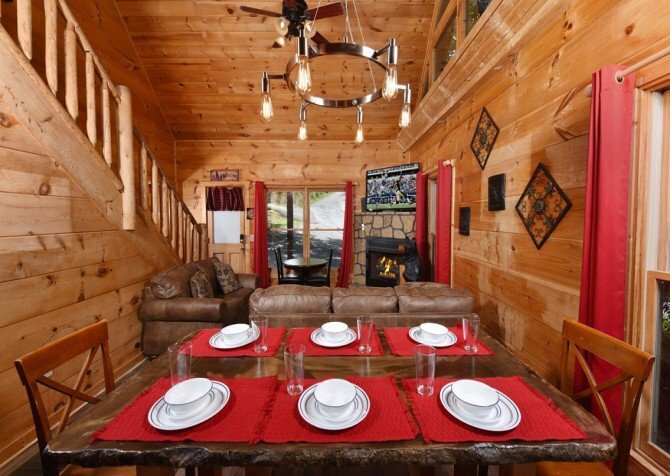 A wonderful cabin for a family vacation, Lorin Aleah offers 2 bedrooms and plenty of amenities. 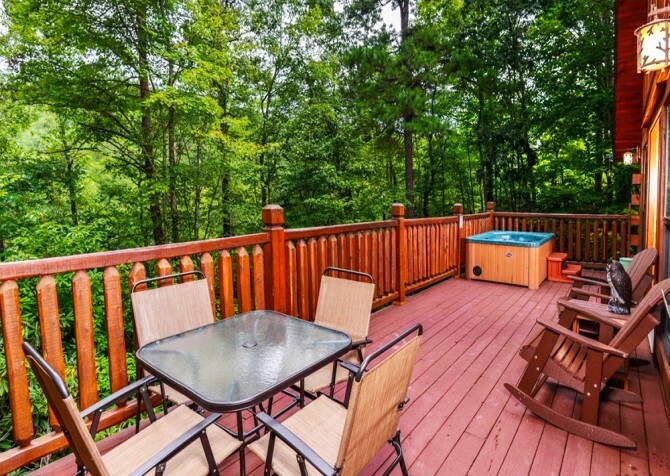 It's pet friendly and has an outdoor hot tub, a close location to downtown Pigeon Forge, and wooded views. Have a cup of coffee in the rocking chairs or cook out on nice days on the charcoal grill. 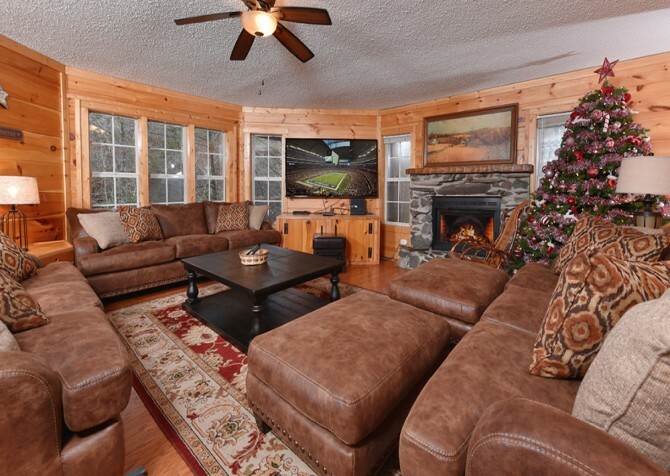 Bring your favorite flicks and have a movie night around the fire in this cozy living room. Applewood Manor can comfortably accommodate up to 12 guests with its 4 bedrooms and 5 bathrooms. 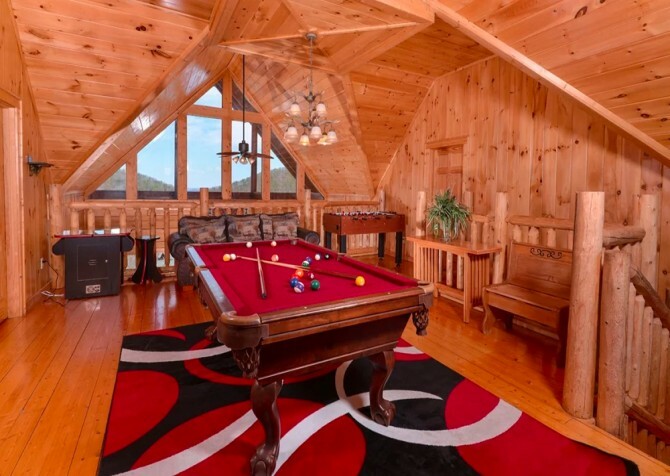 And you’ll easily entertain your group of friends or family with this cabin’s game-loaded loft and resort-quality pool room. 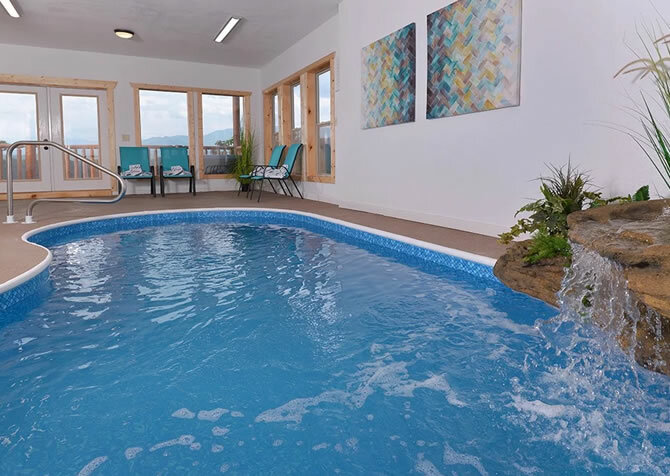 Enjoy an indoor hot tub along with your indoor pool, mountain views, and a short drive to the many attractions, restaurants, and unique shops that make downtown so much fun! 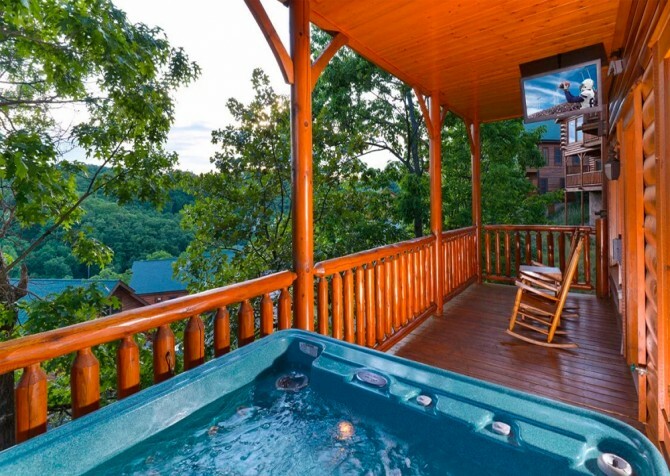 Located near the heart of Pigeon Forge, Hillside Hideaway is a 2-bedroom, 2-bathroom cabin in the Smoky Mountains — complete with an outdoor hot tub, multiple flatscreen TVs, and beautiful mountain views! From entertaining dinner shows and exciting amusement parks to one-of-a-kind restaurants and souvenir shops galore, enjoy downtown attractions every day if you can bear to leave Hillside Hideaway. 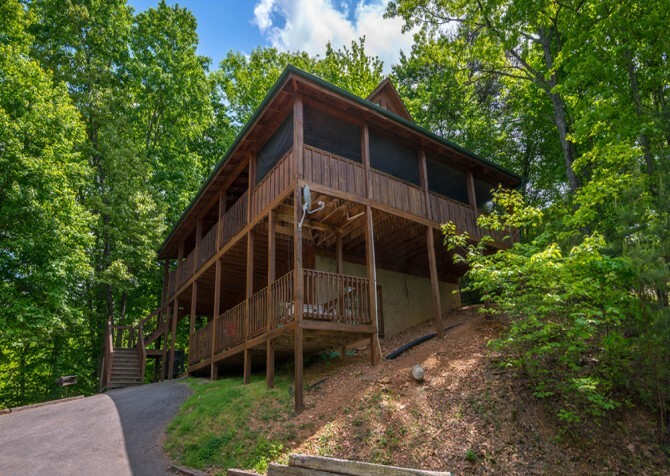 Nestled in Pigeon Forge, Bear Hollow boasts 3 bedrooms, 2 bathrooms, a lounge loft, 4 deck spaces, serene woodsy views, and more! 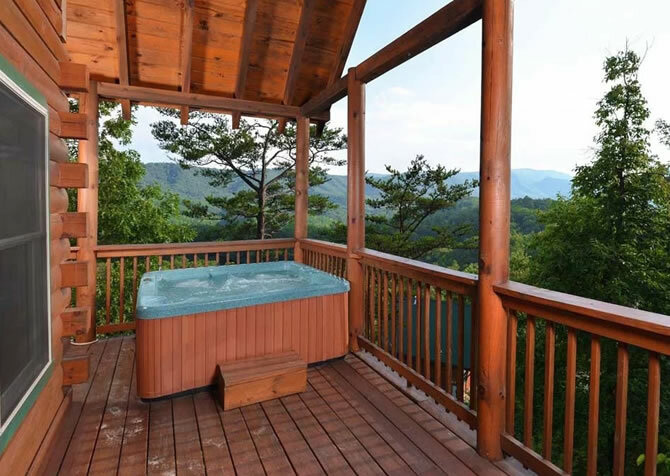 Bring family and friends to this Smoky Mountain cabin for 6 for hot tub soaks in the evenings, epic games on the Xbox 360, movie nights on the flatscreen TV, and mountain memories to last a lifetime. 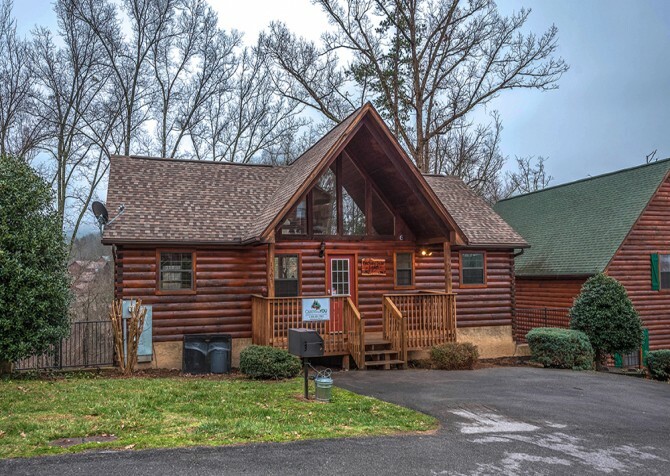 Boasting a convenient location less than 6 miles to Pigeon Forge excitement, Keaton’s On the Creek keeps guests close to in-town fun while remaining tucked away creekside! 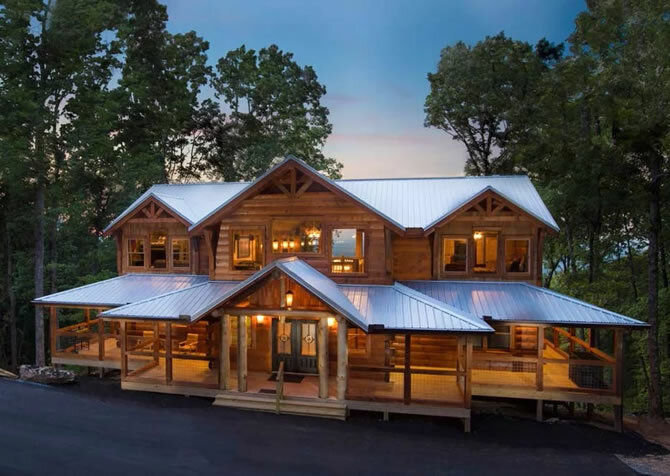 Soak in relaxing riverfront views from the hot tub, enjoy family meals in the large dining room, shoot pool with your best pals, and drift to dreamland in a mix of king, queen, and twin-size beds at this 7-bedroom cabin for 17. 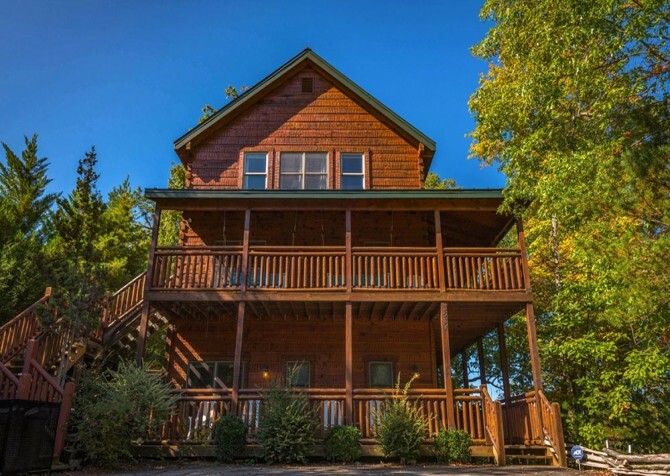 A mere 6 miles to the hustle and bustle of Pigeon Forge entertainment, Hilltop Hideaway is a great choice for a couples’ getaway, family trip, or retreat with friends. 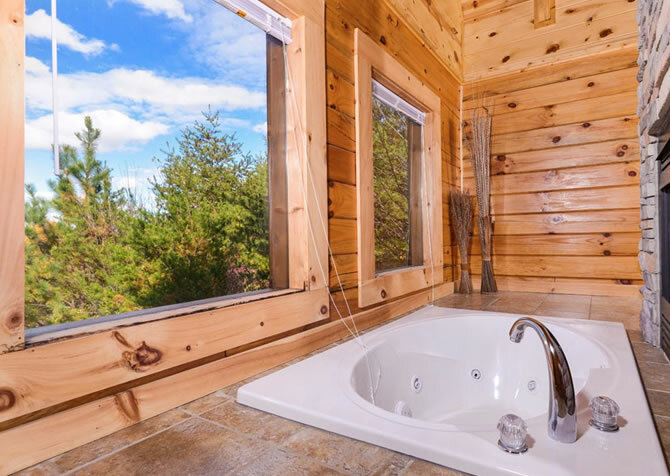 This 2-bedroom, 2-bathroom cabin for up to 8 guests offers king-size beds, en-suite baths, flatscreen TVs, pool and foosball tables, a soothing hot tub, and an electric (heated) fireplace. 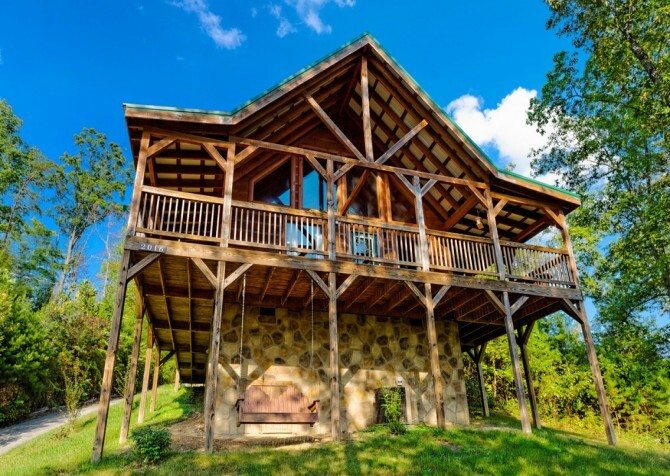 Reconnect with friends, family, and nature at Charlie Brown’s Cabin, featuring 2 master suites, a 4-person hot tub, community pool access, beautiful views, a TV in every bedroom, 3 full bathrooms, a fully equipped kitchen, free Wi-Fi, and more. 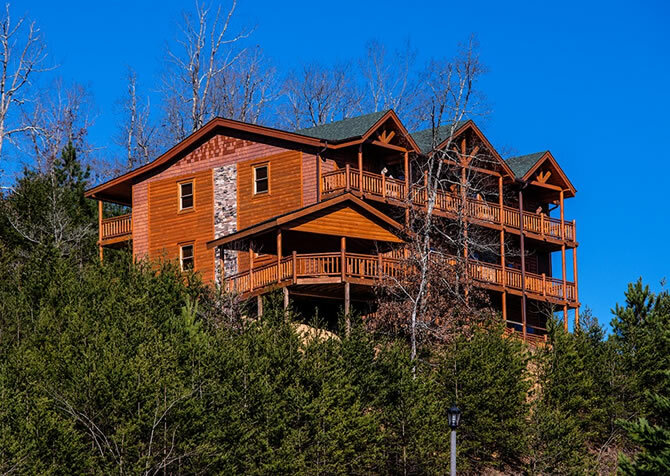 And the best part is this log home keeps you close to Pigeon Forge fun in the gated Bear Creek Crossing Resort — with extra amenities to boot! 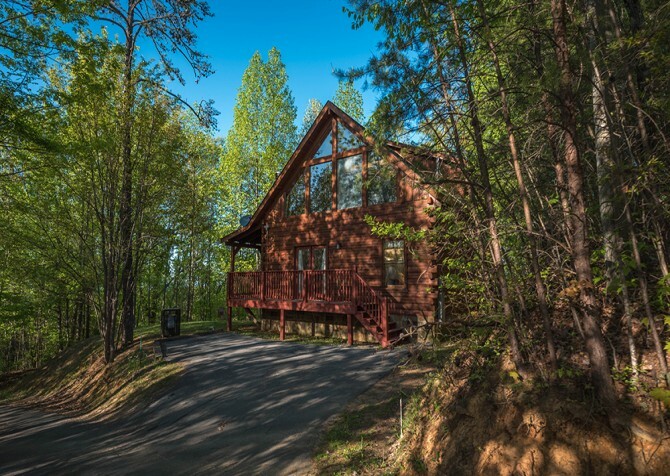 Knotty and Nice is a semi-private cabin nestled in the woods of the Smokies. 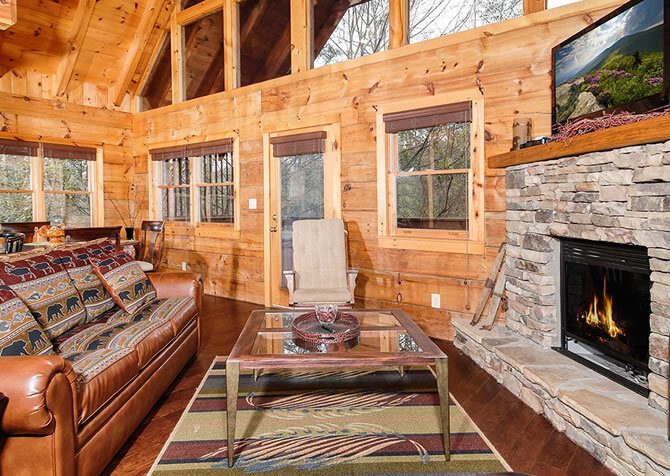 With 1 bedroom and 2 bathrooms, this Pigeon Forge cabin provides all the space you’ll need for a family getaway or a laid-back weekend with friends. 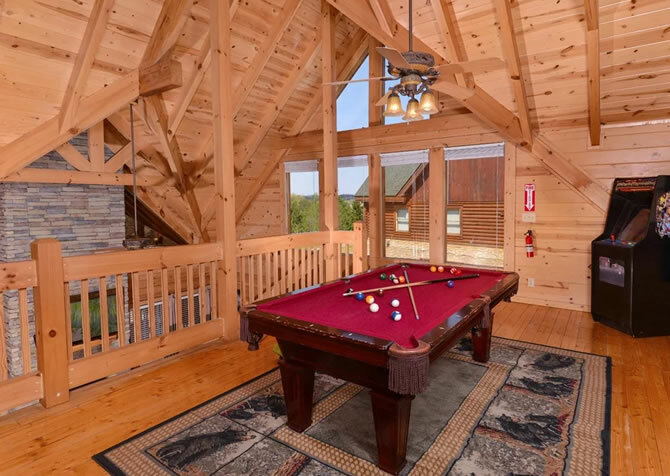 Enjoy a pool table and arcade game, twin bunks for the kids, a wraparound porch with an outdoor hot tub, and more! Located in Bear Creek Crossing Resort, staying in Bear Maximum affords you community indoor and outdoor pool access, easy parking, and cozy mountain cabin furnishings – all close to the exciting attractions, good restaurants, and great shopping in downtown Pigeon Forge. Drive just a little farther and visit the iconic Gateway City to the Mountains: Gatlinburg, Tennessee! 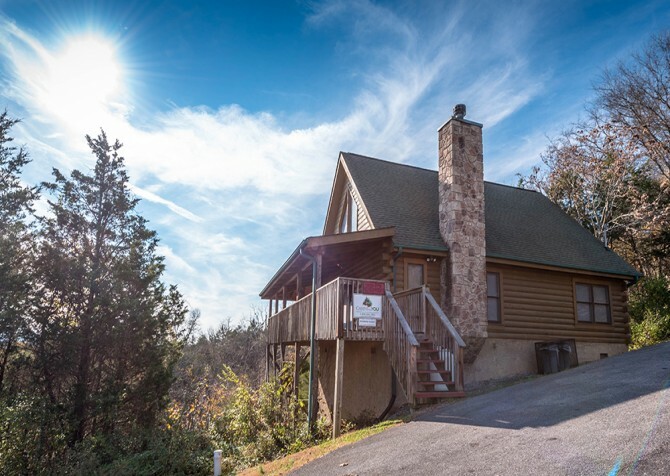 Around 14 miles to Pigeon Forge, The Great Escape is a secluded, 4-bedroom, 4.5-bathroom cabin with wooded views all around, giving you the mountain peace you crave. 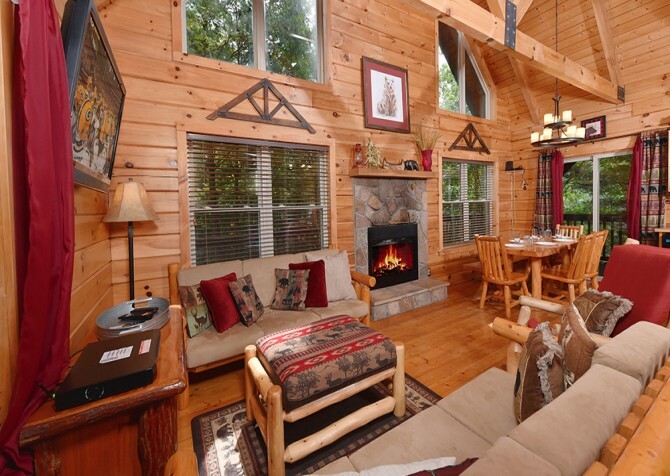 Sleeping up to 8 guests, this log home is perfect for family trips or getaways with friends. Play pool and arcade games, watch feature films on the big screen TV, and soak in the bubbly hot tub! 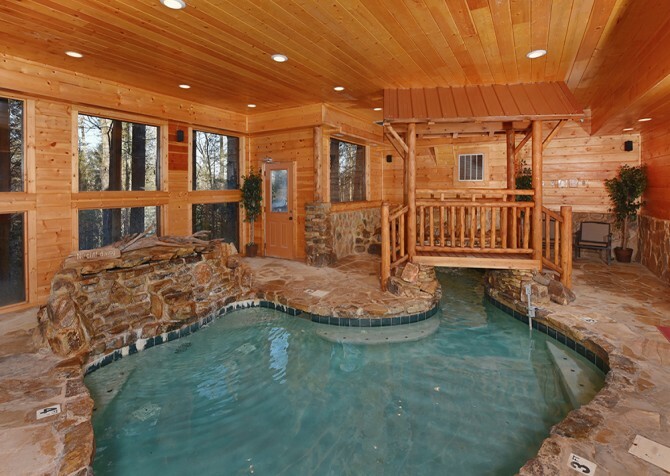 A stone fireplace, an indoor jetted bath, a flatscreen TV, an outdoor hot tub…sounds like A Perfect Paradise. 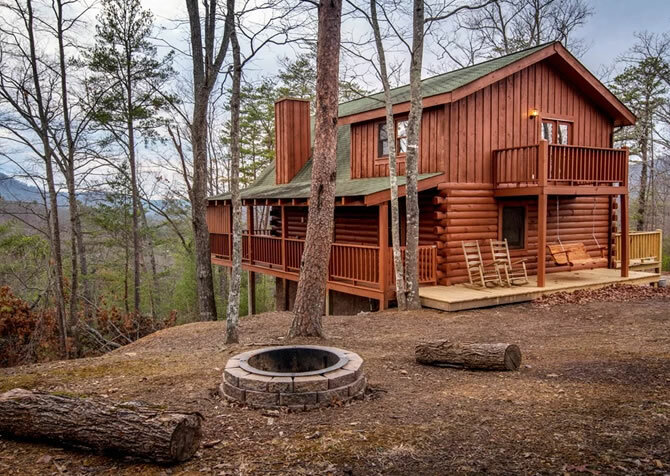 Bring your family or friends to this cozy cabin in Pigeon Forge for in-cabin fun and in-town adventure. Visit local shops, eat at fine restaurants, experience cool attractions, tour interesting museums, and attend entertaining shows — your Smoky Mountain vacation starts here! Fit to sleep up to 6 guests, A Bearz Haven is just the right size for a small family. The authentic log beds and all-log interior, along with the beautiful mountain views, create a rustic and peaceful mountain atmosphere for memorable getaways. 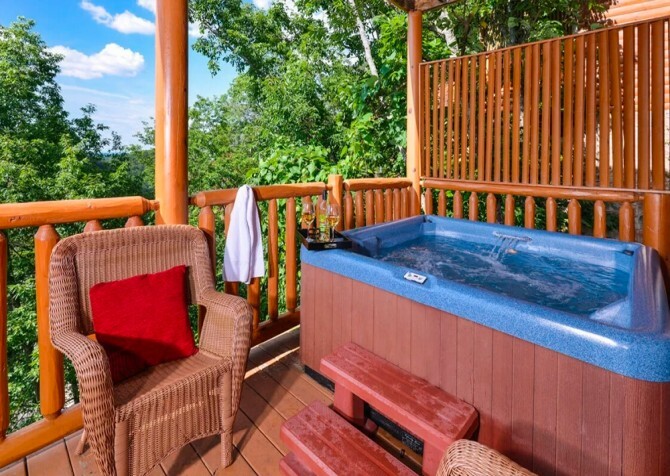 Sit back with a cup of coffee on the porch swing in the mornings or unwind at the end of the day with a soothing soak in the hot tub on the deck. You will enjoy falling in love all over again while rocking hand in hand on the porch swing, unwinding in the bubbly outdoor hot tub, and watching movies by the fire in the impressive stone fireplace. Cook romantic meals in the fully-loaded kitchen before sharing glasses of wine on the wraparound deck and end each night with a soak in the large indoor jetted tub. 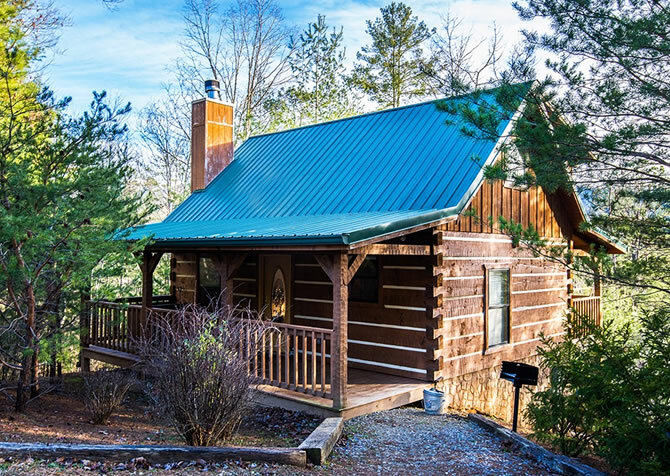 Whether you’re looking for a cozy cabin to unwind after a day of activities or simply want a secluded place for quiet time away from it all, Peanut’s Paradise is the cabin for YOU. Get ready for breakfast on the covered deck, a day of games in the rec room, movie night by the fireplace, and a late-night soak in the jetted tub! Each space was made with relaxation in mind, so slip away to Peanut's Paradise and unwind! 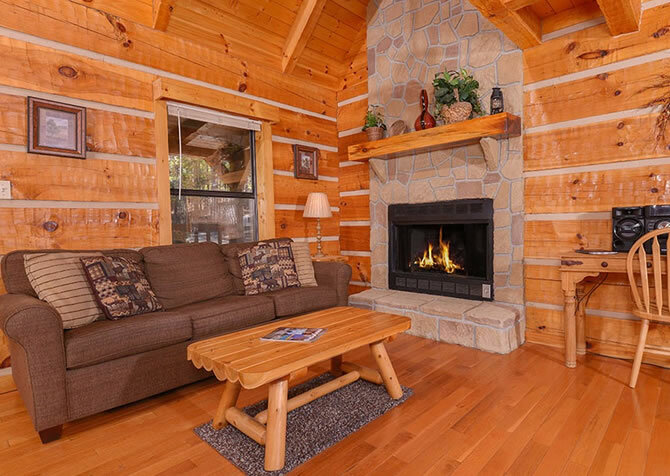 Fun days and cozy nights await at Tennessee Memories, a lovely 2-bedroom, 2-bathroom cabin for 6 in Eagle Springs Resort in Pigeon Forge. Curl up on the sofas for a quiet night in front of the wood-burning fireplace or flip on the flatscreen TV for movie night. Looking for some fun? Shoot some pool before heading into town to explore the many area attractions, restaurants, shows, and shops! 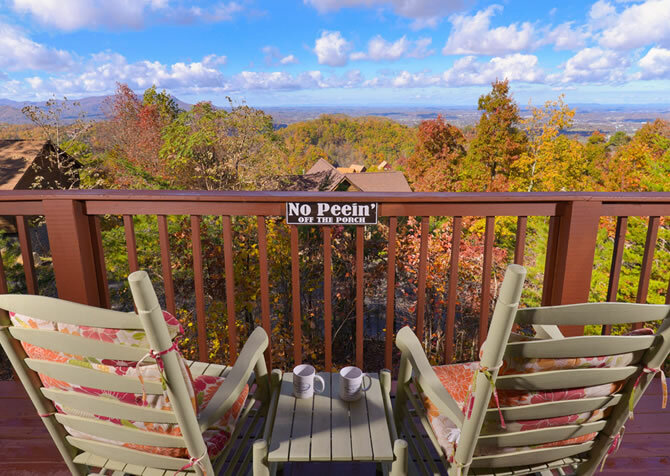 Only a few miles from downtown Pigeon Forge, Jennie’s View is a great pet-friendly rental for family reunions, wedding parties, and other large group gatherings where you want to keep everyone fed and entertained. 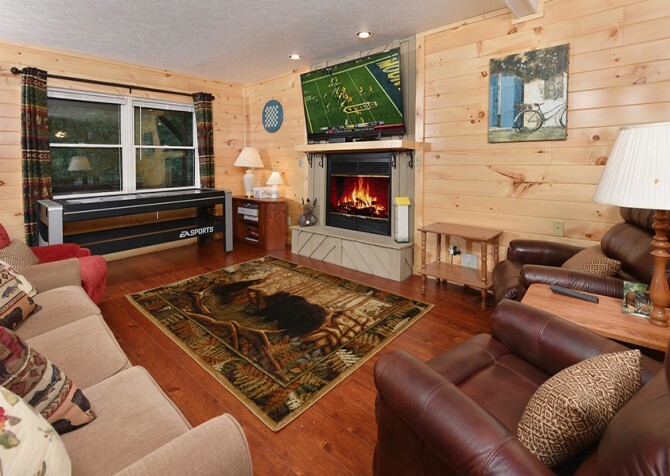 If you’re looking for a cabin with plenty of room and lots of entertainment, Jennie’s View has it all. Spread out with 8 bedrooms and 6 bathrooms inside 4,000 square feet of space! 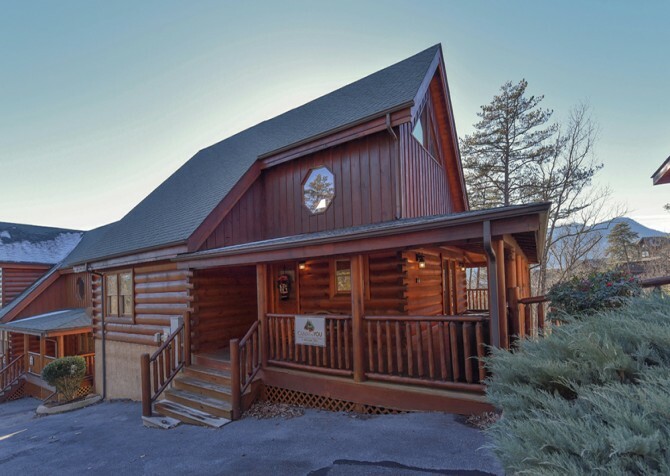 Keeping you close to local fun in Pigeon Forge, Elk Crossing is less than 3 miles to town with peaceful wooded views all around, 3 bedrooms, 3 full bathrooms, and plenty of space for 8 guests. 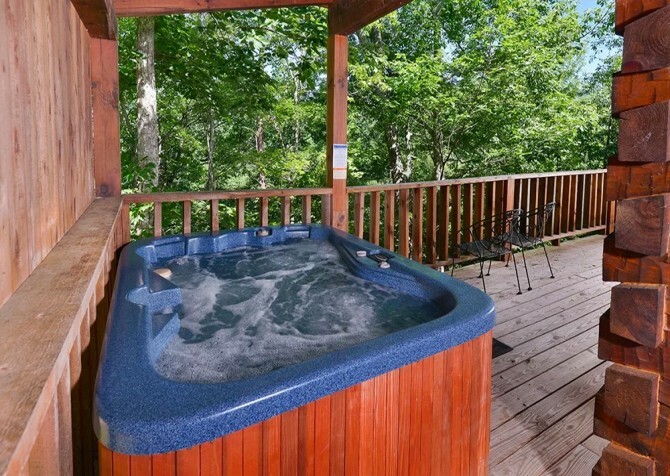 Soak in the soothing hot tub, sip wine on the screened-in deck, read novels by the fireplace, play games and watch movies in the rec room, and slip away to dreamland in 3 king-size beds! 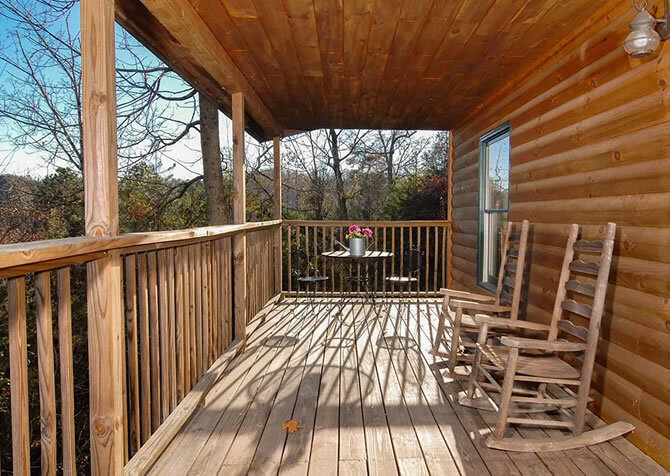 Escape from it all and vacation to this 2-bedroom Pigeon Forge cabin rental. Located an equal distance between Pigeon Forge and Gatlinburg, explore the downtown areas or stay at home in your cabin rental. 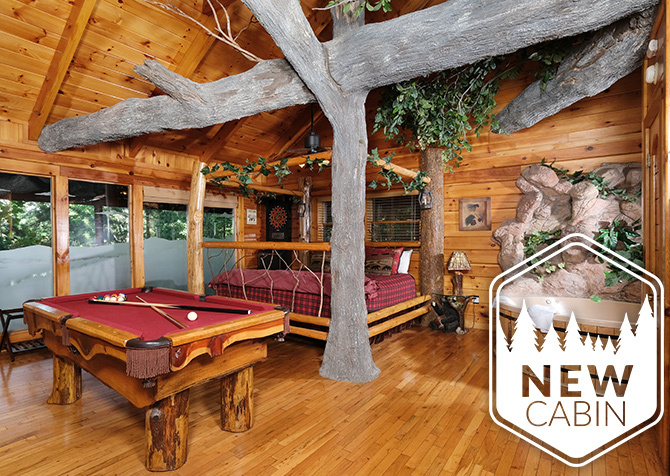 This cabin is stocked with amenities such as a pool table, an indoor jetted tub, and full kitchen. 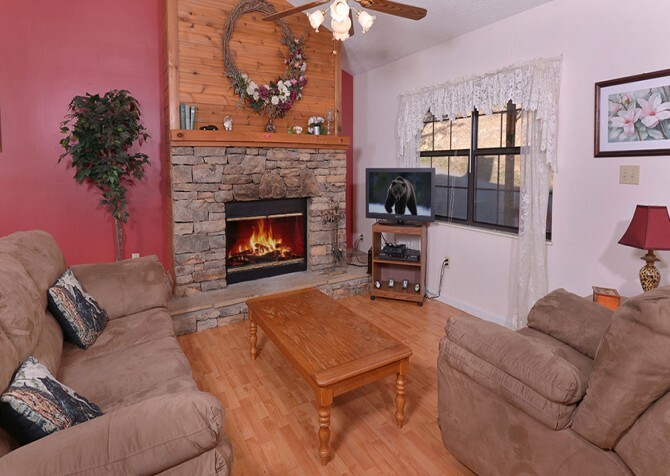 Sit in the rocking chairs, access the wireless internet, or just warm up in front of the gas fireplace. 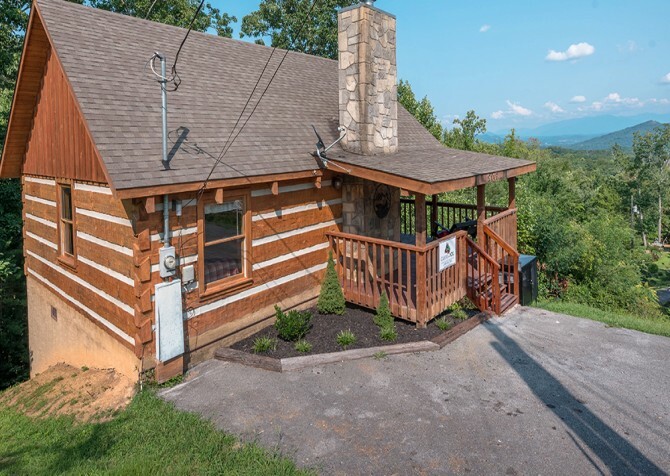 Located only minutes from the heart of Pigeon Forge, Keaton’s Star Spangled Cabin makes it easy to head into town for shopping sprees, local events, exciting attractions, and yummy restaurants. 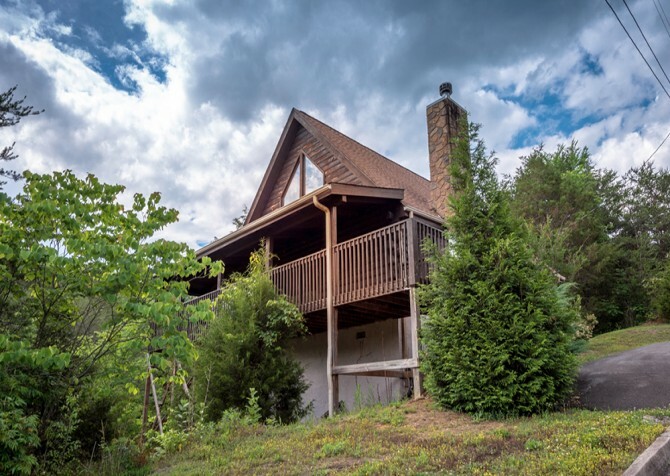 Plus, with 5 king-size beds, 5 bathrooms, a large rec space, 3 nice decks, a fully equipped kitchen, and an outdoor hot tub, this cabin in the Smokies is more than just a cozy place to stay — it’s home. 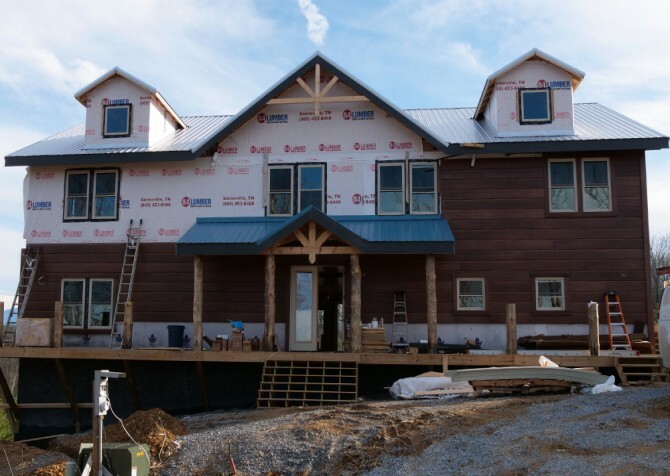 Around 8 miles from the heart and soul of Pigeon Forge, Copper River is a 3-story, 3-bedroom, 3.5-bathroom home for 10 in Cedar Falls Resort with fun amenities, including an outdoor hot tub, charcoal grill, 2 full-length porches, woodsy views, king-size beds, a Wii U plus an Xbox One, and a private indoor pool to rule them all! 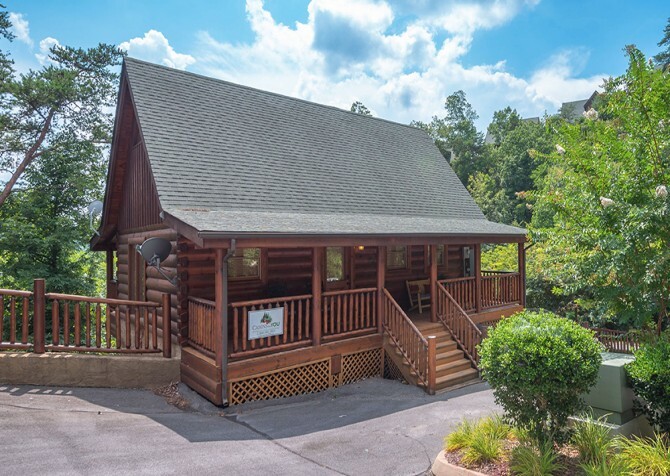 Located in Pigeon Forge near local attractions, shopping centers, and restaurants of all kinds, Hickory Splash Lodge is a 3-bedroom, 3.5-bathroom home for 12 with bonus amenities sure to please any group! 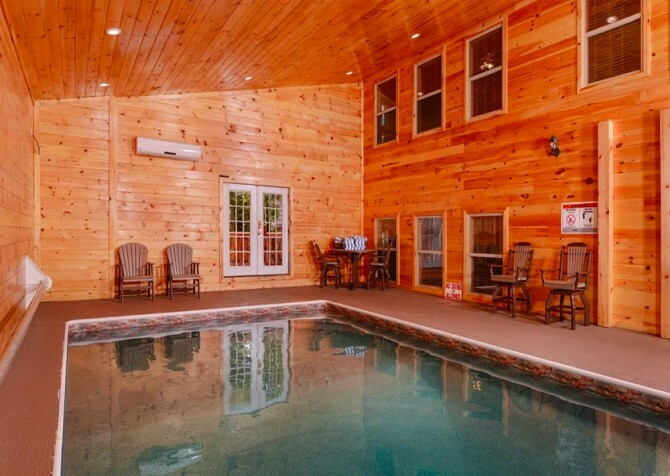 After a day in town, head to the cabin for a splash in the private pool, a soak in the hot tub, game night in the rec room, and a feature film in the home theater! Heart's Desire is perfectly suited for a romantic escape. 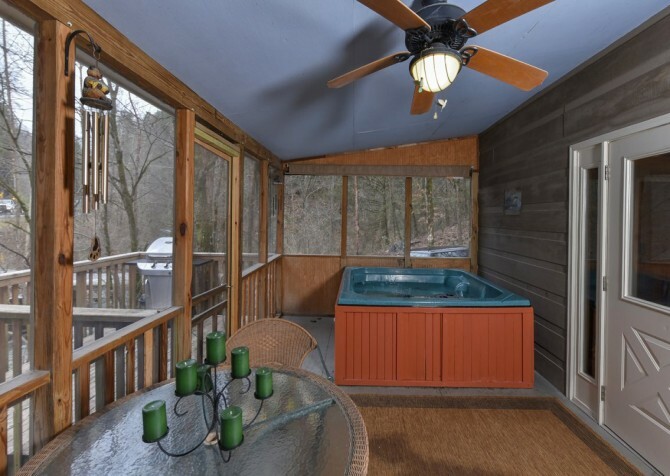 This semi-private 1-bedroom, 2-bathroom cabin offers lovely wooded views from the covered hot tub, a soothing indoor jetted tub, and a TV in the bedroom. Away from the hustle and bustle of the city, Heart's Desire is a welcome escape. You can also fire up the grill! Conveniently located between Pigeon Forge and Gatlinburg, The Looney Bin offers the best of both worlds! 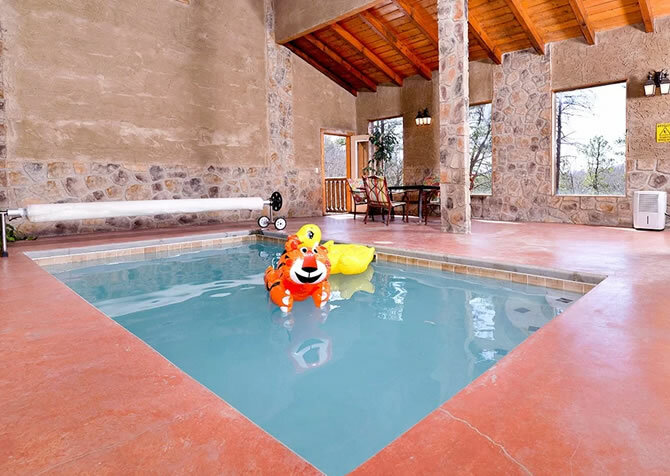 Plus, you’ll have a cozy 2-bedroom cabin for 8 to return to each evening for playful rounds of pool, outdoor hot tub soaks, comedy flicks on the flatscreen TV, spa baths in the indoor jetted tub, cocoa by the gas fireplace, and snuggles in a king-size bed. Located about 9 miles from downtown Pigeon Forge, American Heartland is peaceful yet convenient to dozens of local shops, delicious restaurants, and fun attractions. The cozy 1-bedroom cabin features an indoor jetted tub, foosball table, and high-speed internet. If you're traveling with a group, American Charm and American Dream are within walking distance! 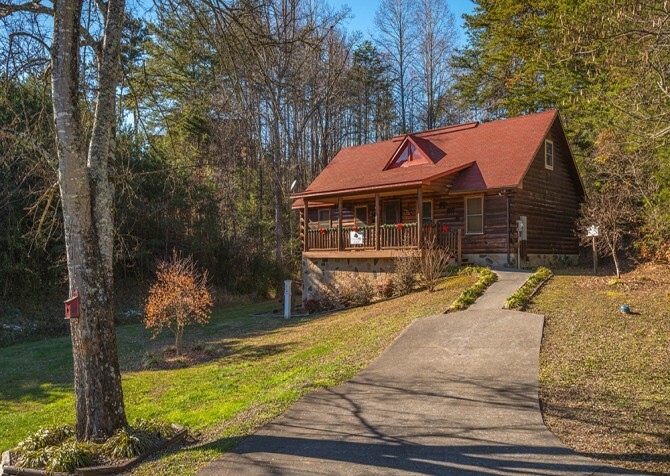 This lovely log cabin in the Beside the Still waters community boasts Smoky Mountain charm and lots of great amenities to make you feel at home. 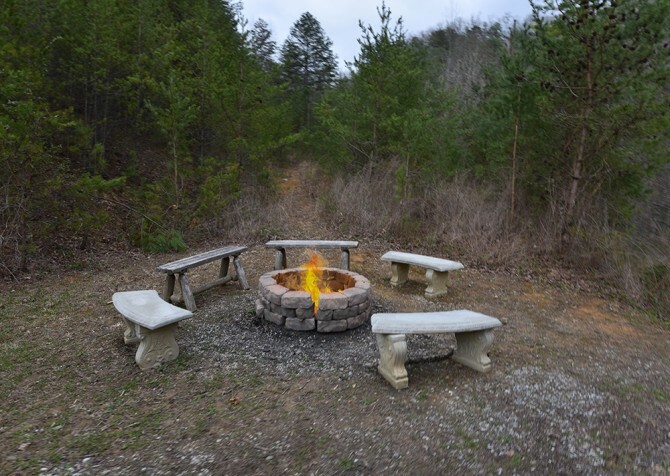 Bring your own movies for the Blu-ray player, unwind in the hot tub on the covered deck, whip up meals in your kitchen, check out the nearby hiking trails, or gather around the community fire pit for s’mores and stories at night. Approximately 8,000 square feet, Luxury Lodge offers not only attractive amenities but also plenty of space for a large group to stay comfortably. Relax with your afternoon tea on one of the 4 decks, take a dip in the private indoor pool, bake goodies for everyone in the fully equipped kitchen, watch movies in the theater room, or play poker for the win in one of the 2 rec areas! 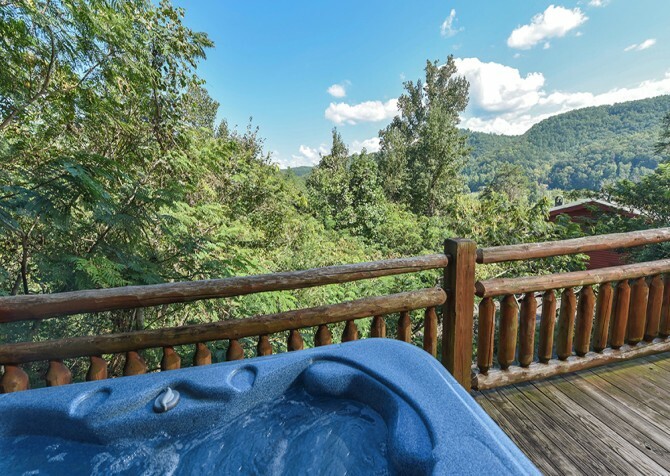 Under 9 miles to both Pigeon Forge and Gatlinburg, American Dream lends you wooded views, an outdoor hot tub, and a relaxing time in this open-concept cabin with a dining room meant for 2. Cozy up in the cabin or explore downtown for dining, shopping, wineries, and outdoor fun. 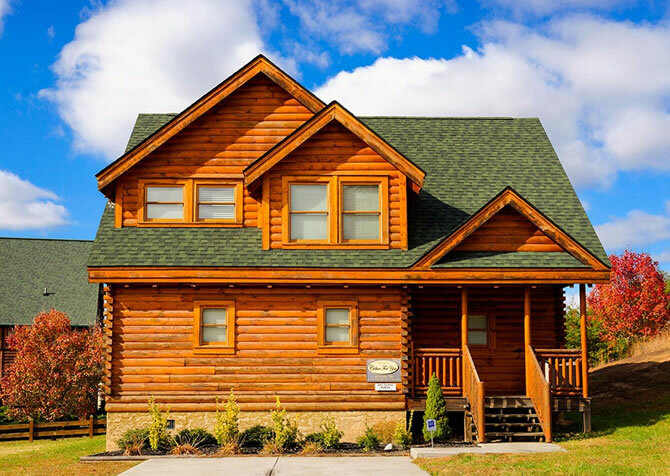 Stay close to the fun of Pigeon Forge and the great shopping at the Tanger Outlets when you stay at this beautiful all-log cabin with a convenient location. Private amenities include a big screen TV, electric fireplace, full kitchen, hot tub, and jetted indoor tub. 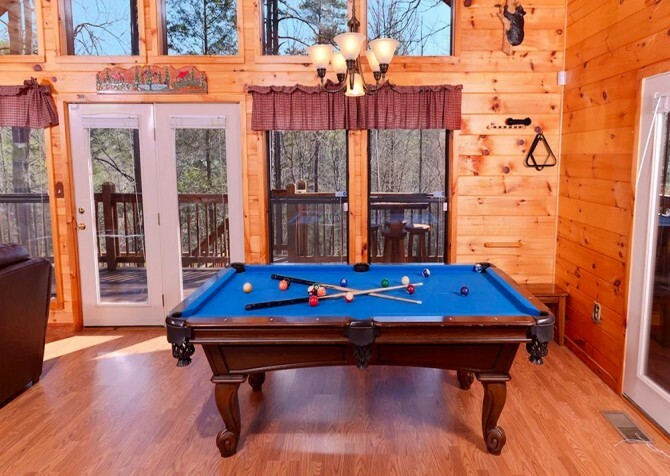 This pet-friendly cabin also has a pool table and air hockey table! Couples, families, and friends should check out Happy Days for their next Pigeon Forge getaway, great for a honeymoon, romantic weekend, retreat with a few friends, or fun family getaway. This cozy cabin has 1 bedroom and a sleeper, providing comfortable accommodations for 4. Enjoy the comforts of home and more with only a 5-mile drive to downtown at our Happy Days. Head to Dream Catcher Spirit in Pigeon Forge for quality time with family, friends, or coworkers. Play pool or foosball in the rec room, watch a movie marathon on the big screen TV, enjoy the wooded views through the floor-to-ceiling windows, prepare tasty s’mores at the firepit, and take evening soaks in the hot tub — all within reach of downtown fun. 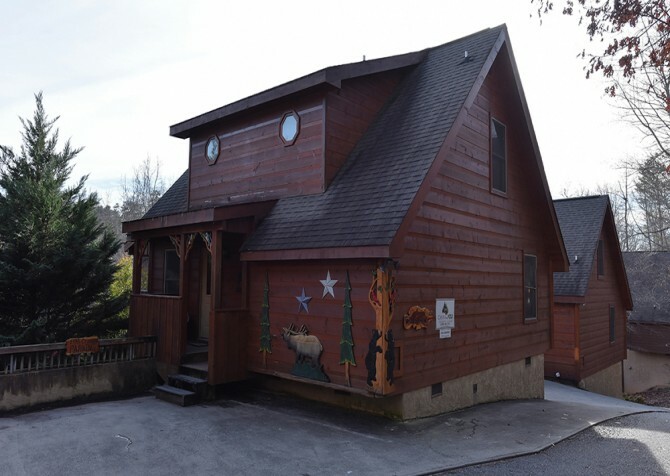 Just over 5 miles to the heart of Pigeon Forge, Little Bear Lodge offers guests convenient access to downtown attractions, shops, and restaurants. 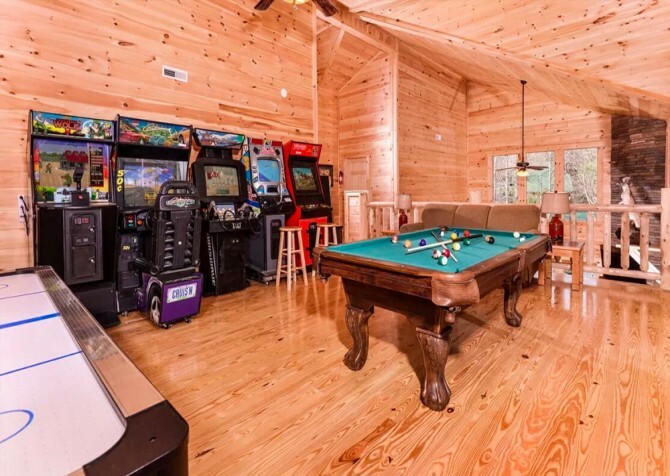 After exploring, head back to this cozy cabin for 10 for arcade games, fun with foosball, movies on the big screen Ultra HDTV, relaxing soaks in the outdoor hot tub, and snuggles in the master suite. 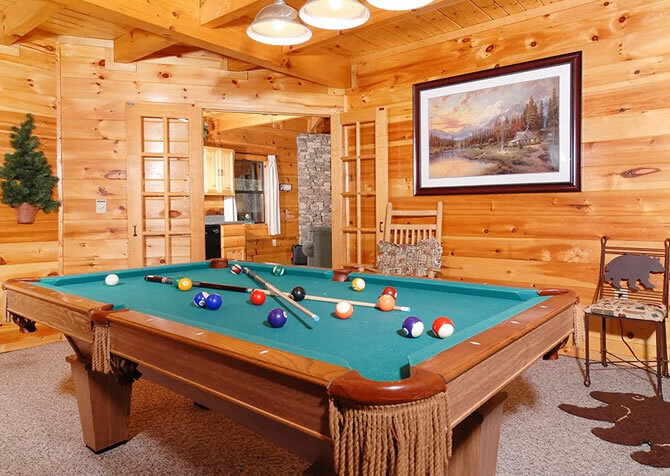 After long days exploring downtown Pigeon Forge, retreat to Almost Home for a comfy king-size bed, puzzles and pool games with the kids, meals made in the fully equipped kitchen, and peaceful wooded views as you relax in the hot tub. Toss some steaks on the gas grill, unwind with a good book on the porch swing, or head to the community pool to splash around in summer! For small group getaways and family vacations, check out Cozy Corner in the Hidden Springs Resort. 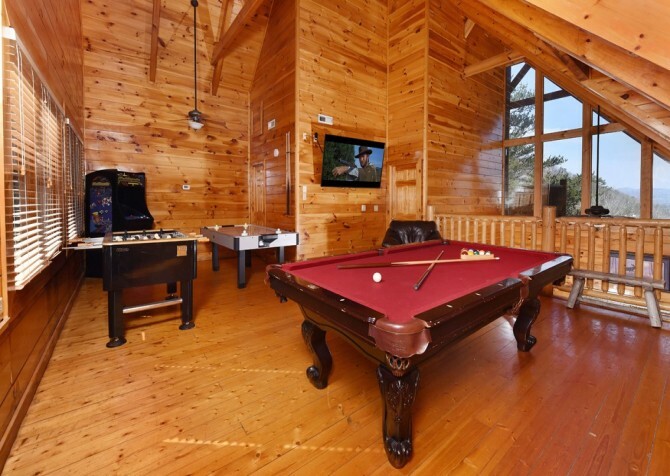 This 6-person cabin offers a pool table and arcade system in its large living area as well as flatscreen TVs in every bedroom. 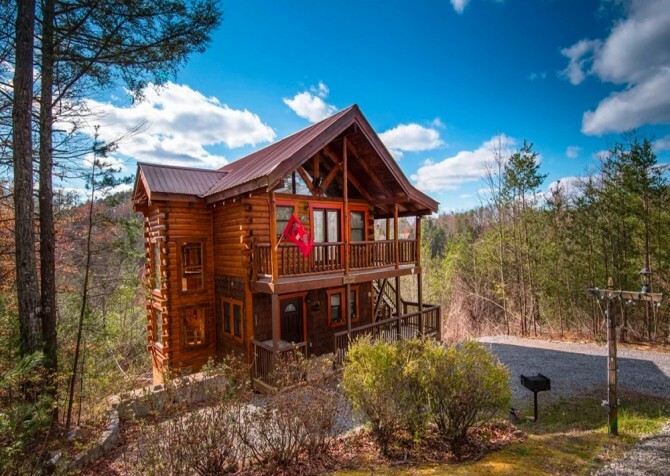 But the entertainment is endless when you make the short drive from this cabin to downtown Pigeon Forge, where you'll find Dollywood, The Island, moonshine, and more! 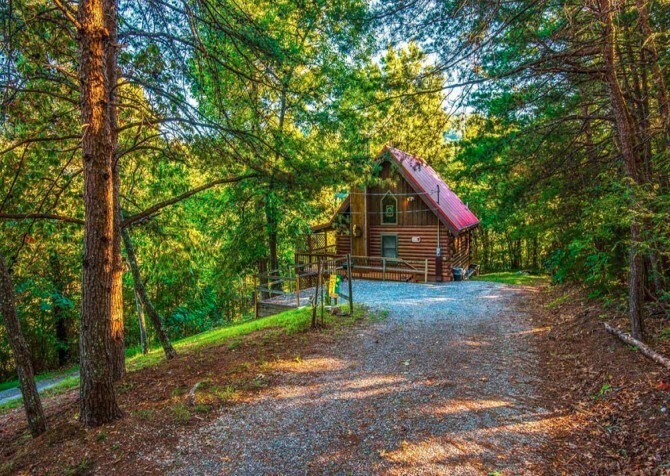 Located less than 6 miles to Pigeon Forge, Keaton’s Wild Animal Cabin keeps you close to all the in-town excitement without sacrificing the serenity of the Smoky Mountain forest. 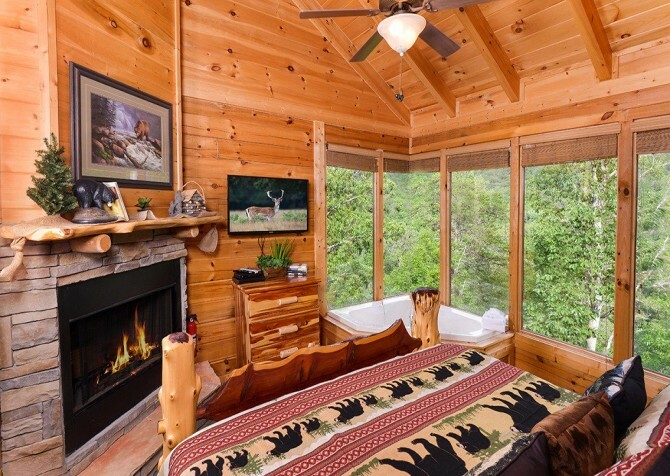 Sip coffee on the deck with tree-studded views, soak in the steamy hot tub, play rousing rounds of pool, and snuggle with your spouse in a king-size bed at this 3-bedroom cabin for 8. 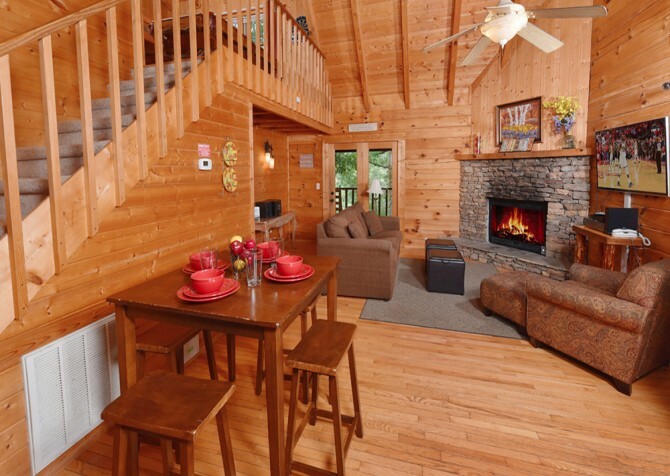 Less than 6 miles from the heart of Pigeon Forge, Moonglow is a 2-bedroom, 2-bathroom cabin for 6 in Summit View Resort. 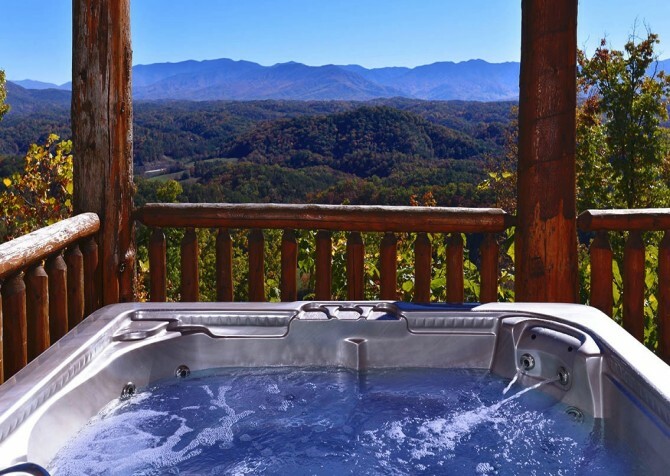 Soak in the outdoor hot tub, play foosball and arcade games with friends, watch movies on the flatscreen TVs, and enjoy beautiful mountain views from the master suite’s private balcony before drifting to dreamland in the king-size bed. 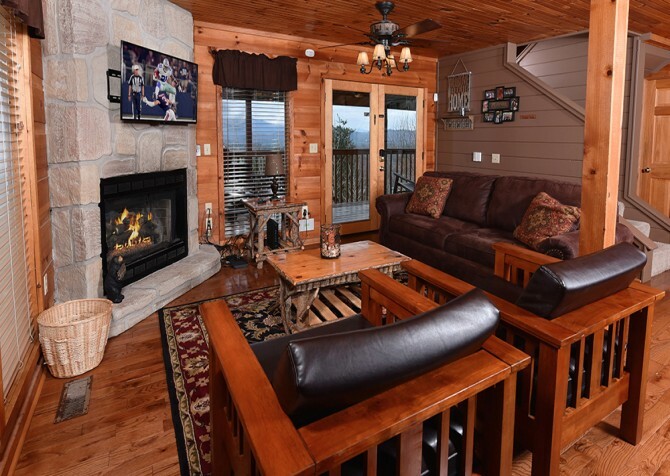 Step into the Smoky Mountain trees and enjoy a 6-person cabin with all the right amenities to make your Pigeon Forge stay relaxing and fun. 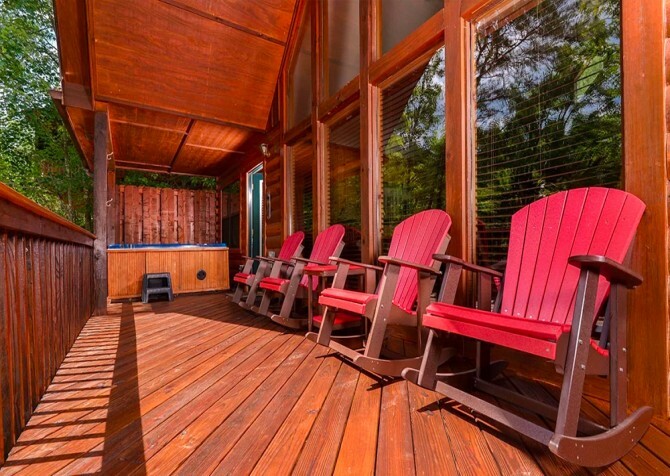 Along with the fun and games, you can relax with an outdoor hot tub, cozy up in front of a wood-burning fireplace, and relax with multiple outdoor sitting areas. Knotty Desire is also just 10 miles from downtown, so explore the many attractions in the area! At only 1 mile from the heart of Pigeon Forge, Holden On is ideal for families or friends who wish to enjoy the peace of nature yet stick close to fun attractions. 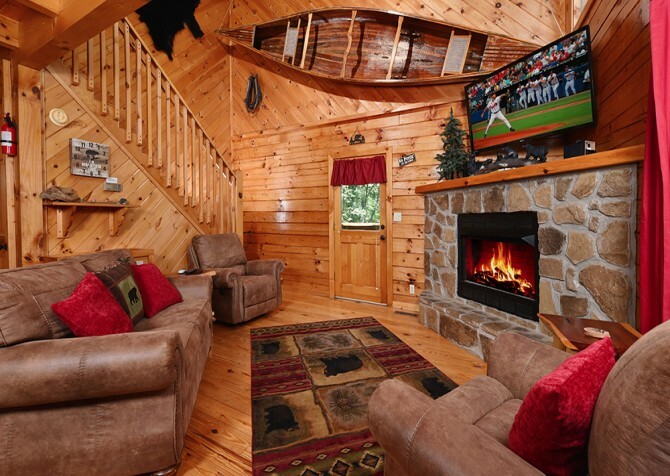 Spend all day checking out the local sights, then head back to the cabin for hot tub soaks, movies on the flatscreen, foosball in the game loft, and sweet dreams in a queen-size bed. 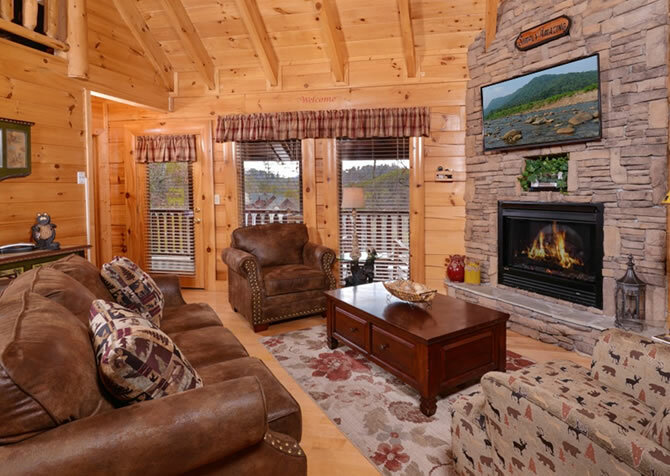 Located near all the exciting attractions of Pigeon Forge, Emerald and Evergreen at Sherwood is a 6-bedroom, 6 ½-bathroom cabin in the Smokies. Spend the day playing, shopping, and dining in town and return to your vacation rental for a swim in the private indoor pool, game competition in the rec room, and movie night in the home theater. Under 3 miles from downtown Pigeon Forge, A Cheerful Heart boasts serene wooded views, wireless internet access, an outdoor hot tub, a fully equipped kitchen, a king-size bed in the master suite, retro arcade games, air hockey, and an in-cabin theater with a 60-inch flatscreen TV, reclining seating, and 100s of movies on Netflix. 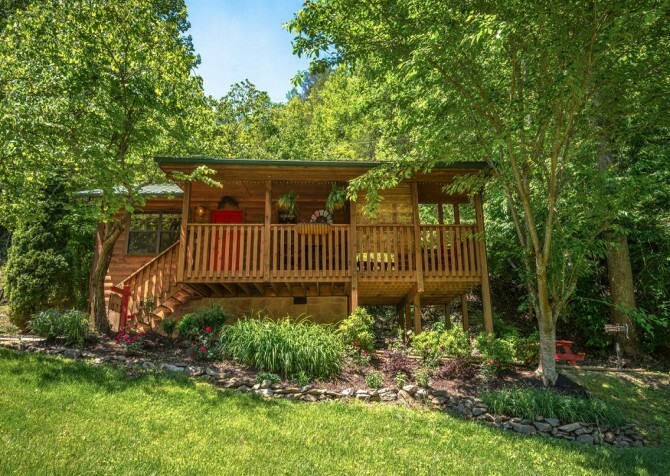 Situated along the riverside in Pigeon Forge, Tennessee, this lovely cabin offers a spacious deck with hot tub and rocking chairs where you can enjoy your water view. 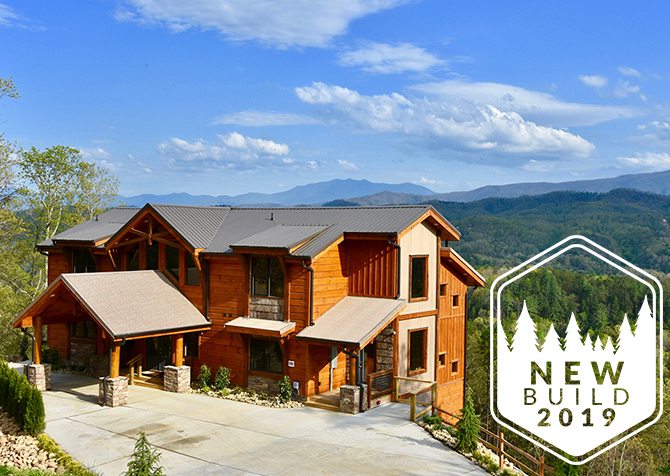 This pet-friendly cabin offers up to 4 bedrooms, sleeps 10 guests, and is great for a family vacation. 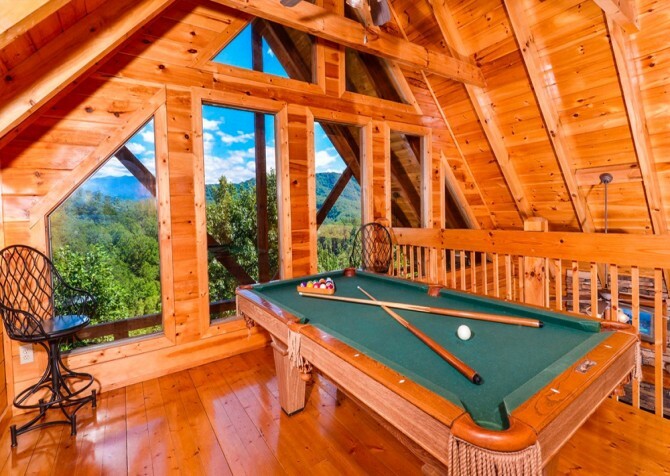 Challenge your friends to a round or two on the foosball or pool table or grill out for a relaxing night in the Great Smoky Mountains. 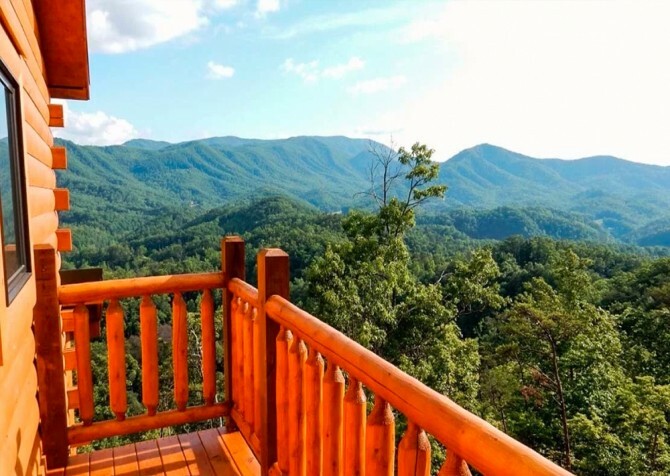 With views of the Smokies for miles, Mother’s Dream is a great choice for a semi-private locale that’s not too far from Pigeon Forge’s family-friendly restaurants and attractions. 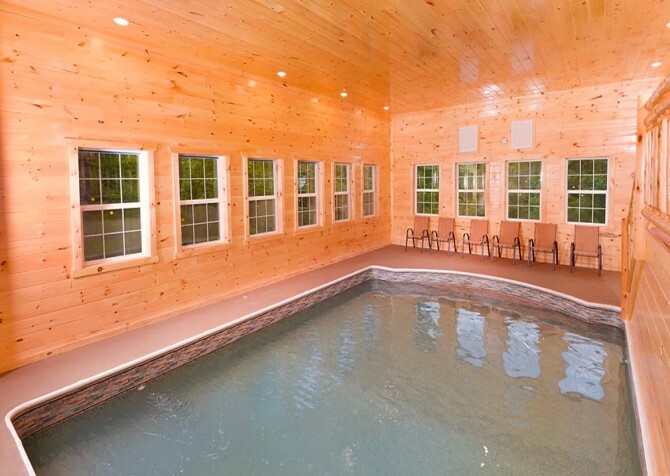 Enjoy room for 12 guests inside 3,000+ square feet of space as well as indoor games, an outdoor hot tub, and a gorgeous private pool! 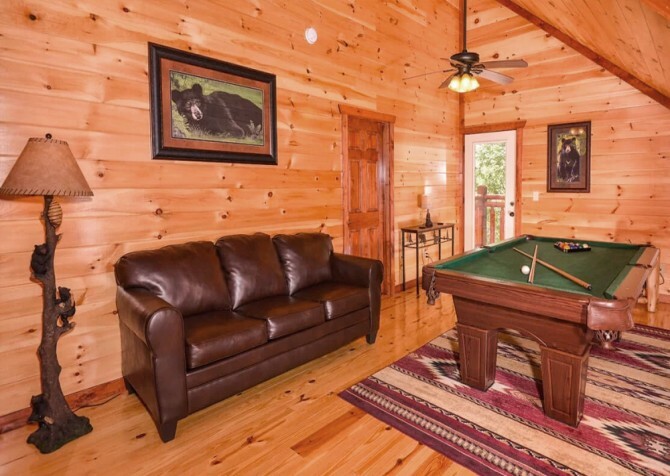 Good times await at Grizzly Getaway, a 2-bedroom, 3-bathroom cabin in Pigeon Forge. After a day of fun in town, 2 king-size beds, a queen-size bunk, and 1 sleeper sofa will give you plenty of ways to cozy up for the night. Plus, you can unwind in the outdoor hot tub, play arcade games and pool in the loft, and host movie night in the spacious living room! 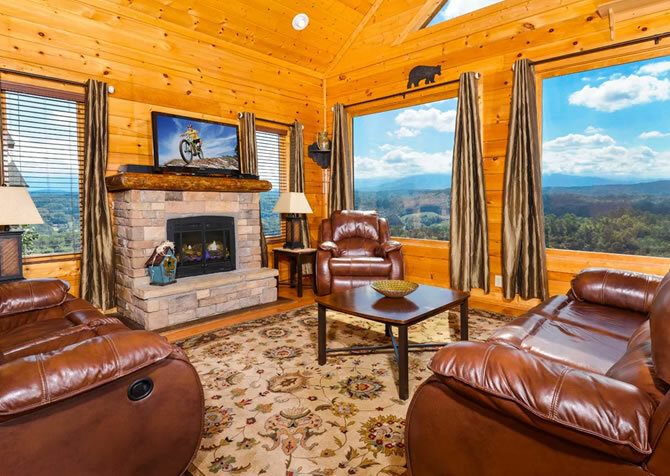 Bring the next family gathering, couple’s getaway, or vacation with friends to this beautiful 4-bedroom cabin with spacious rooms, high-end amenities, elegant décor, and space for guests to enjoy incredible, expansive mountain views! 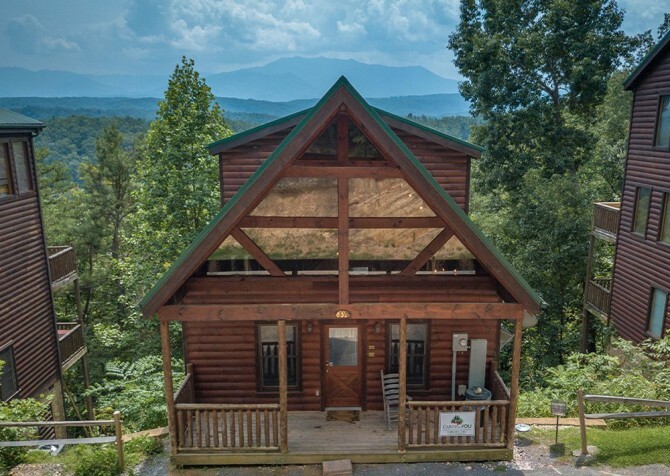 A 2-bedroom plus loft, 3 1/2-bathroom pet-friendly cabin in Pigeon Forge, Moondance boasts beautiful mountain views, an outdoor hot tub, plenty of outdoor seating, a full kitchen, and bunk beds the kids will love. Relax in the living room or play foosball and pool while watching the big screen TV in the rec room. It's great for a family or group of friends, with room to sleep up to 8 guests. 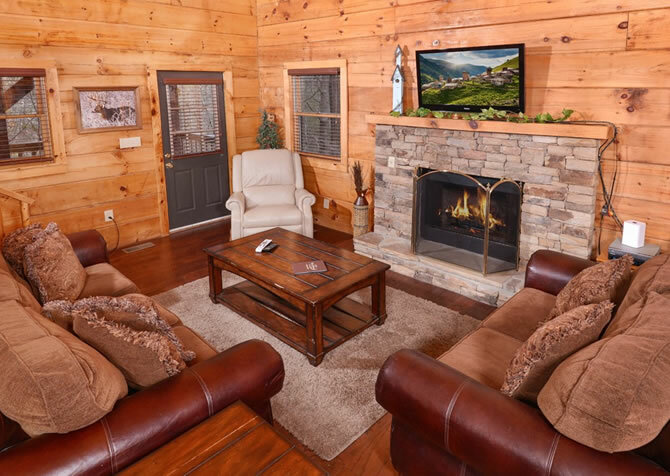 Enjoy a quiet escape from daily life with friends or family in a cozy cabin tucked into the Smoky Mountain evergreens while only a short drive from the excitement, shopping, and restaurants of downtown Pigeon Forge. 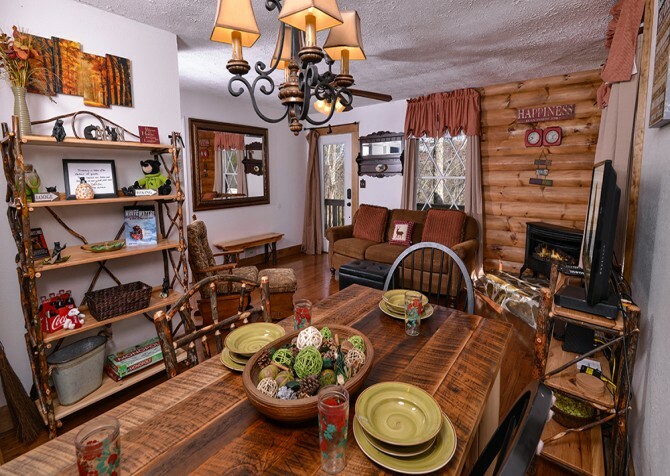 Situated conveniently between Gatlinburg and Pigeon Forge, this 1-bedroom cabin exudes Smoky Mountain charm. The master suite in the loft features a log canopy bed, and indoor jetted tub. With room to sleep 2, Stolen Moments is just the right size for a honeymoon, romantic getaway, or a peaceful weekend alone. 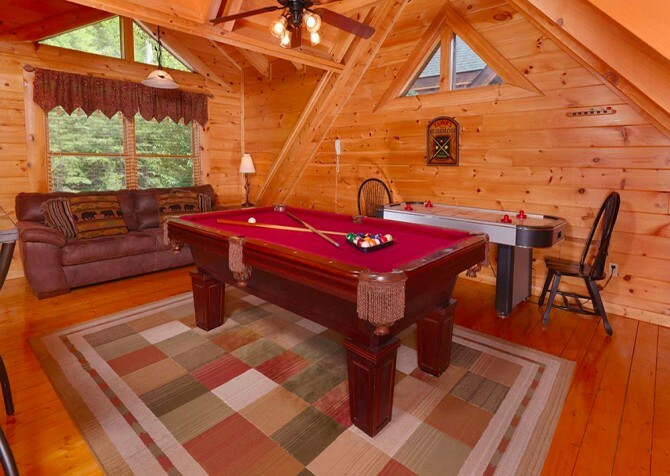 With a pool table, hot tub, and full kitchen in the cabin, you won't want to leave! 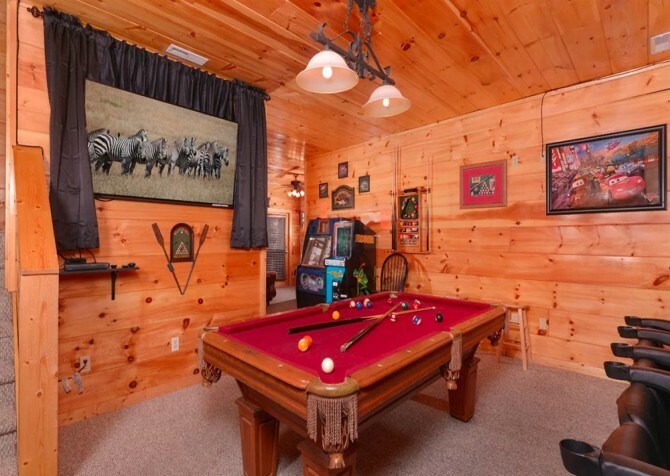 Featuring arcade games and a pool table, this 2-bedroom, 2-bathroom cabin has no shortage of fun! Room to sleep up to 10 guests makes it great for a week in the mountains with family or friends, and the semi-private location makes it a peaceful escape from a bustling city. 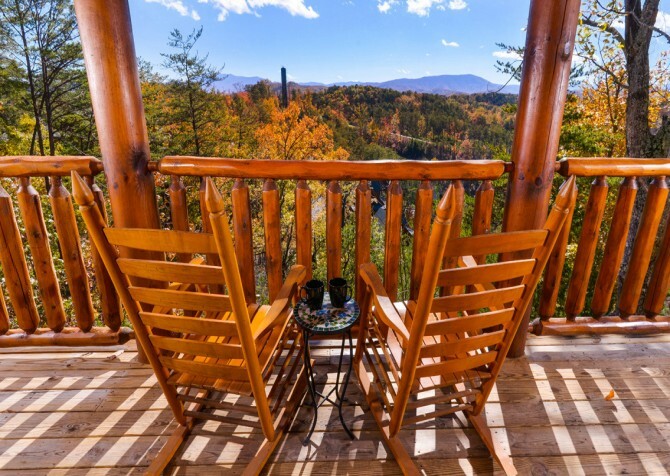 Breathe in the fresh mountain air as you soak in the hot tub or have a cup of coffee on the wraparound porch. 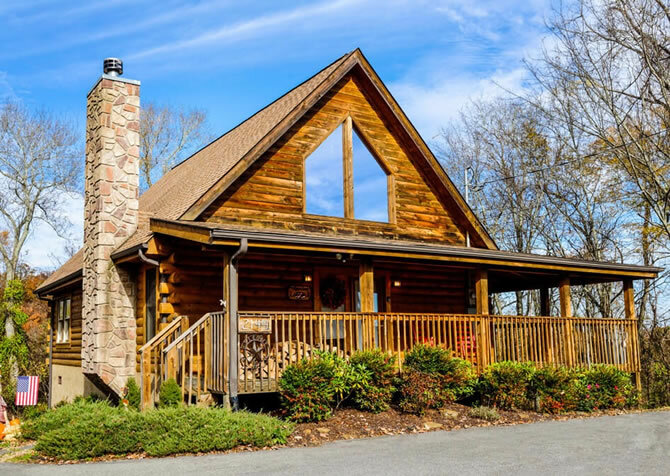 Venture less than 6 miles to the heart of Pigeon Forge when you stay at Keaton’s Streams and Dreams, offering tranquil river and wooded views with space for 14. 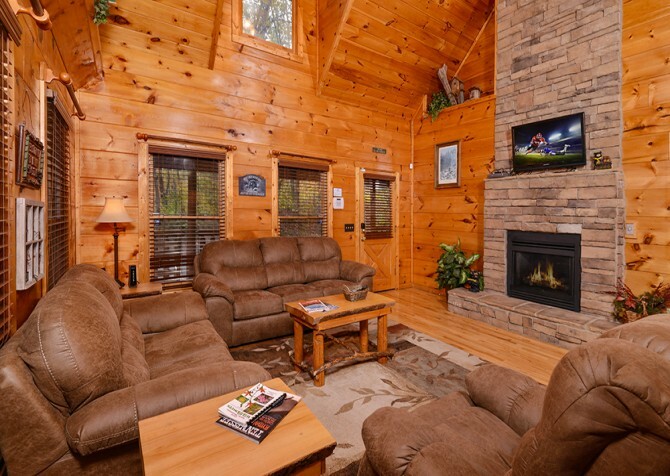 This 4-bedroom, 3-bathroom cabin is great for large family trips or group getaways with pals. 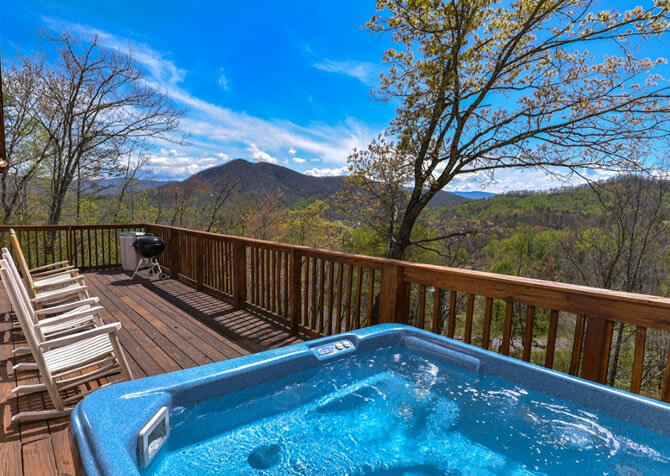 Watch films on big screen TVs, soak in the outdoor hot tub and indoor jetted tub, and unwind with a cup of joe by the Cove Creek — mere steps away. 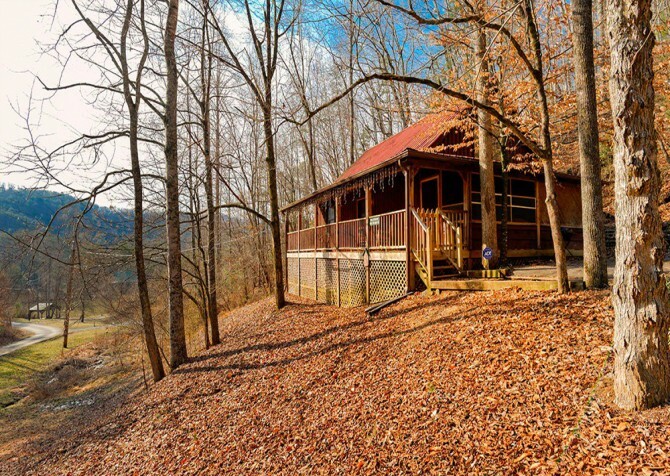 Prepare to fall Beary in Love with this semi-secluded cabin for 4 in the Smokies! 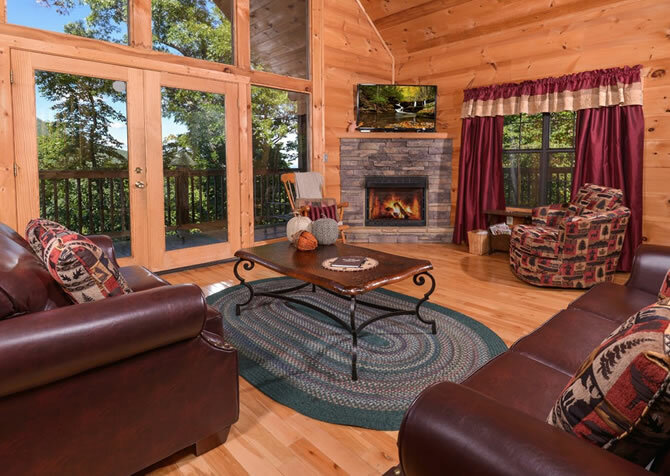 This Pigeon Forge abode is a beautiful 1-bedroom, 1.5- bathroom cabin rental, boasting an outdoor hot tub, flatscreen TVs, a king-size bed, pool table, gas fireplace, and more! 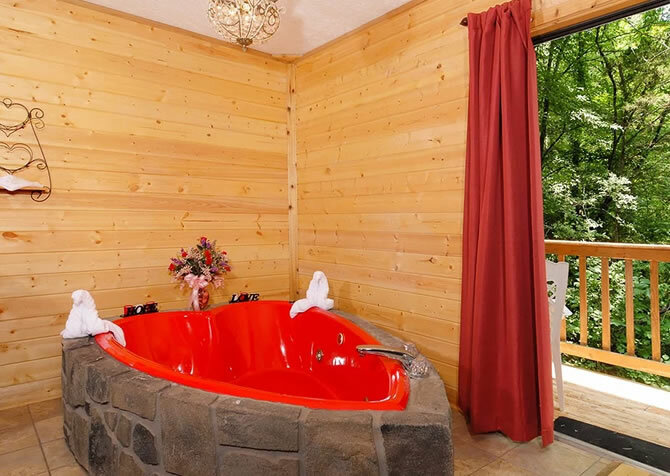 With lovely wooded views and an authentic all-log interior, Beary in Love is a true Smoky Mountain escape. 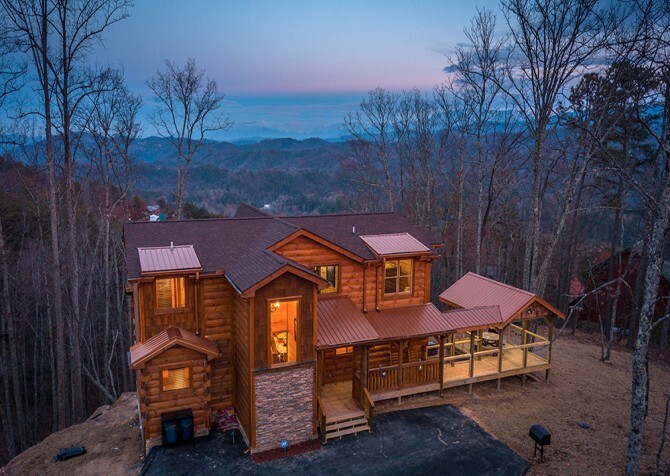 This Pigeon Forge cabin is a great family escape, featuring 4 bedrooms and master retreat complete with electric fireplace and indoor jetted tub. Game tables such as foosball and pool offer you hours of fun, and internet access allows you to keep up with work or the outside world. 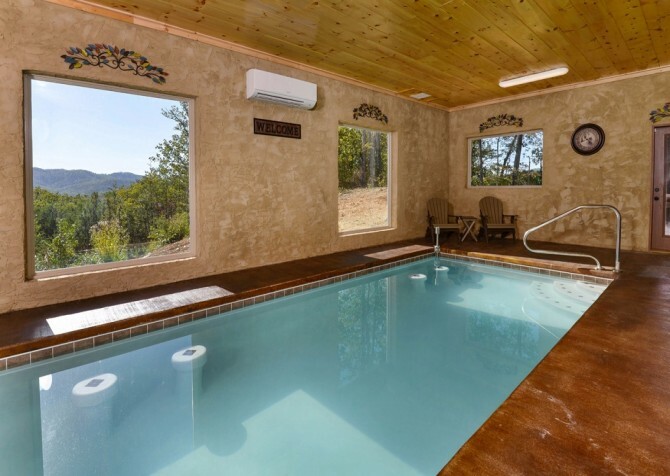 Soak in your fantastic mountain view as you lounge in the hot tub or head to the community pool for a summertime dip.